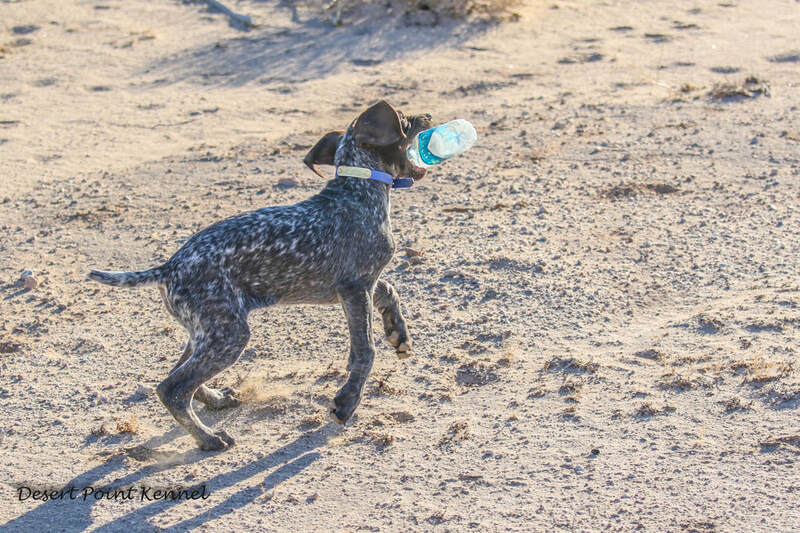 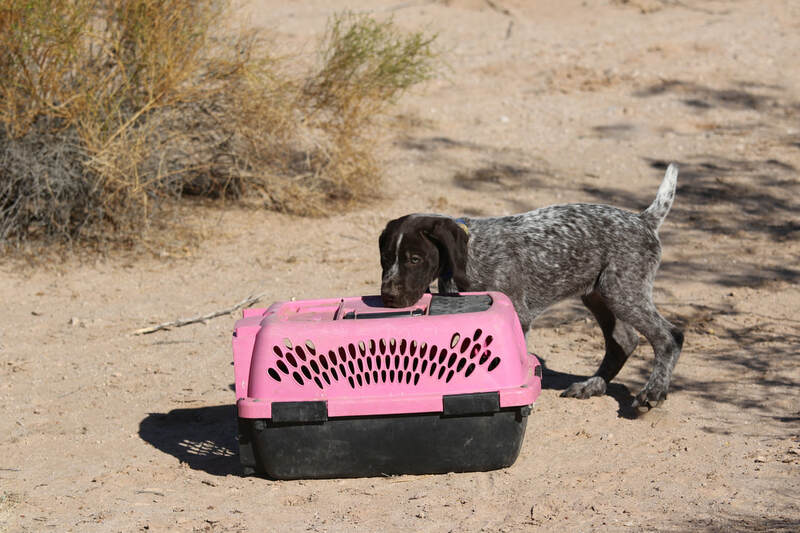 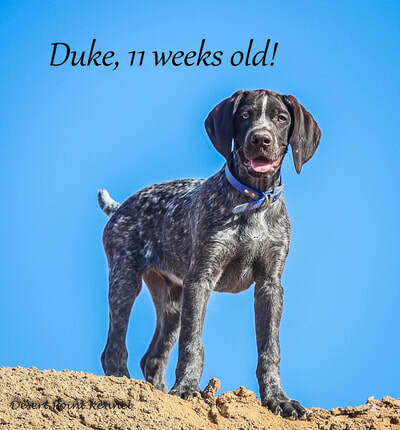 What Age Can Pups go home? 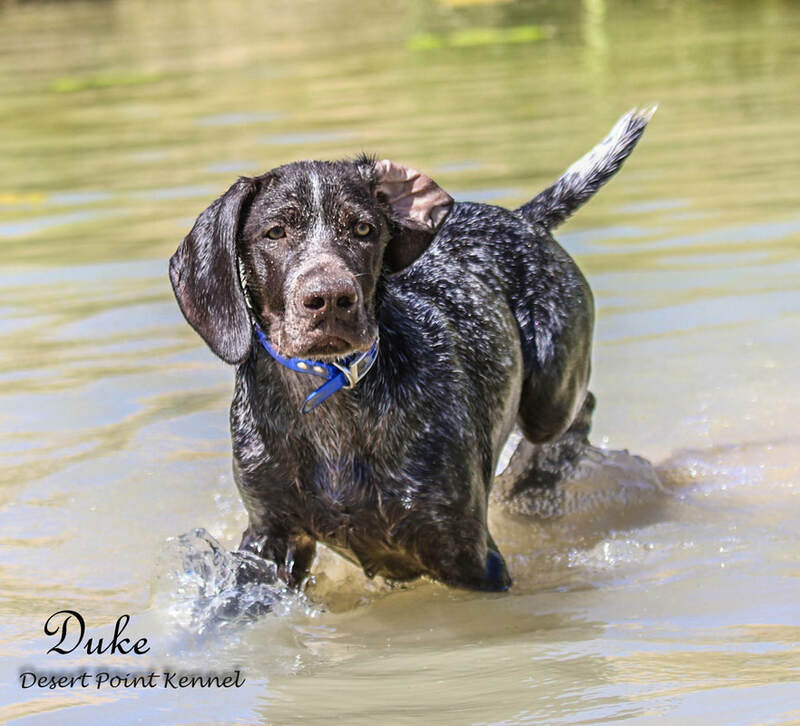 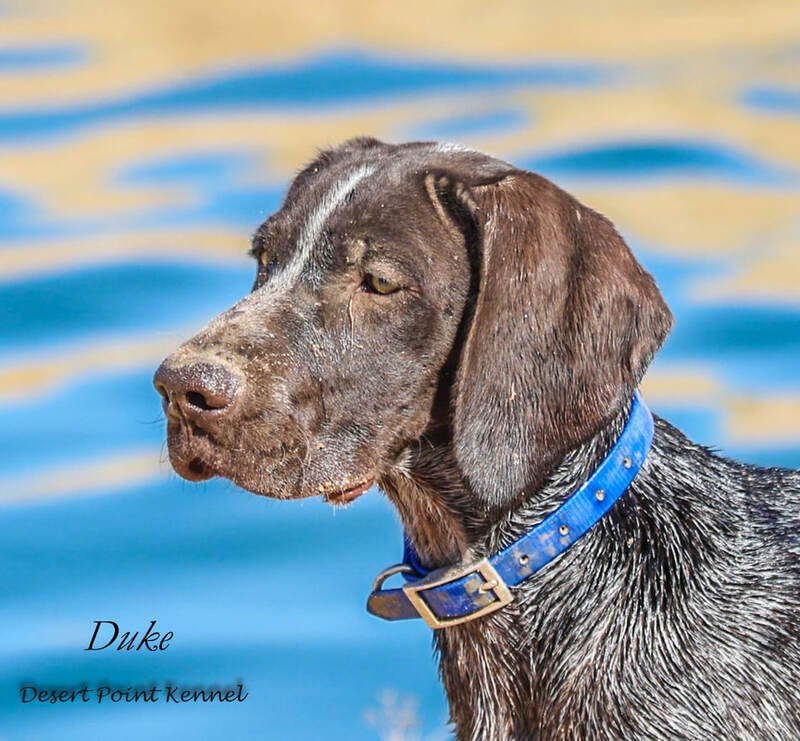 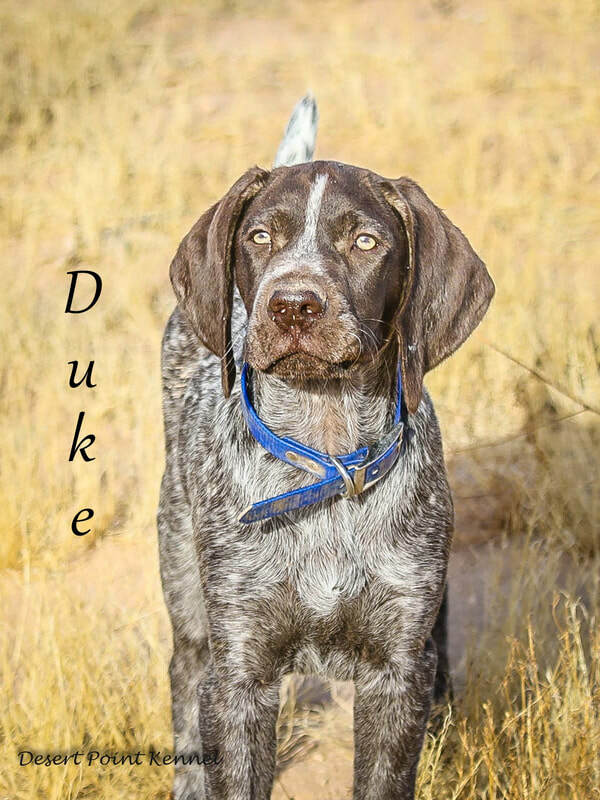 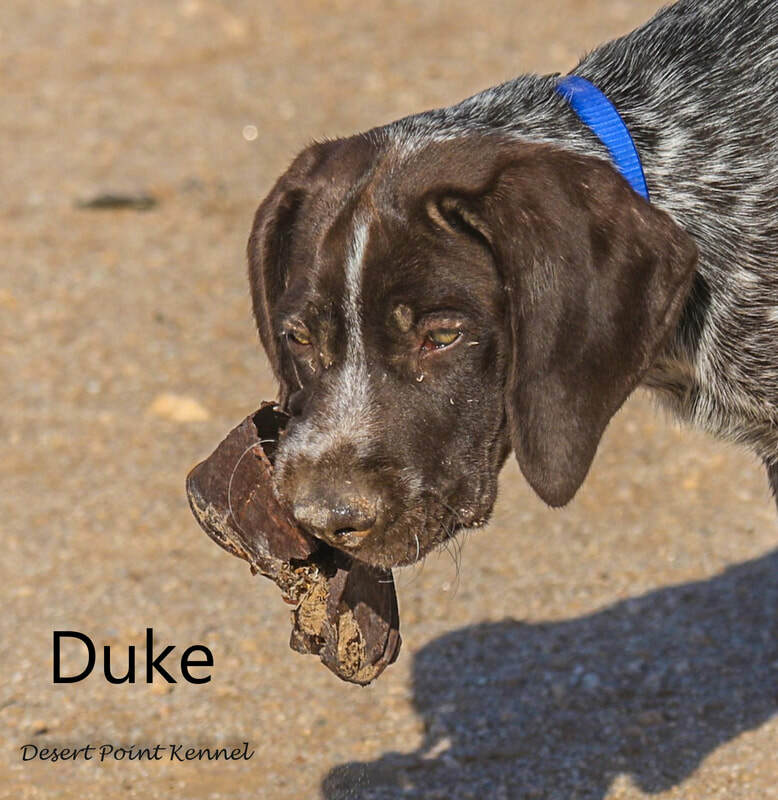 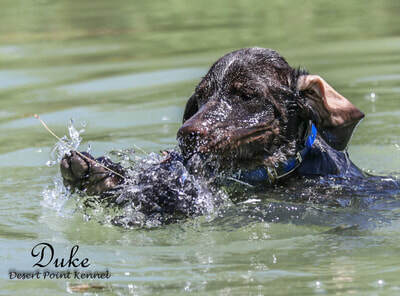 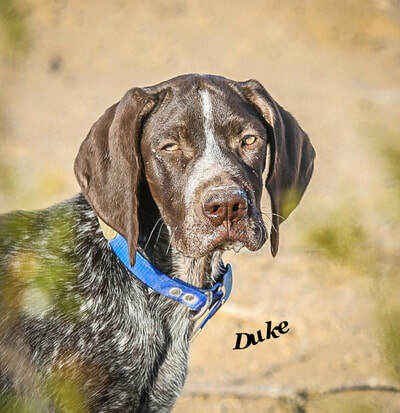 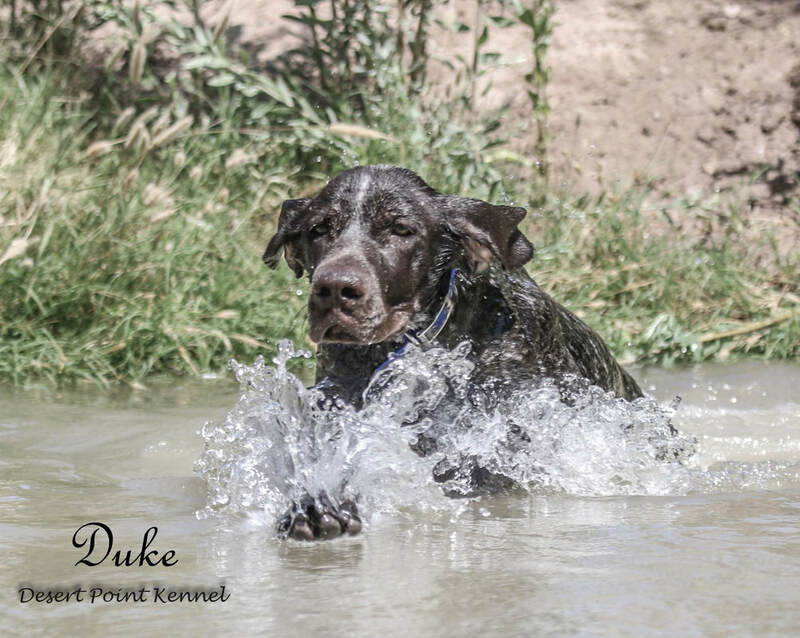 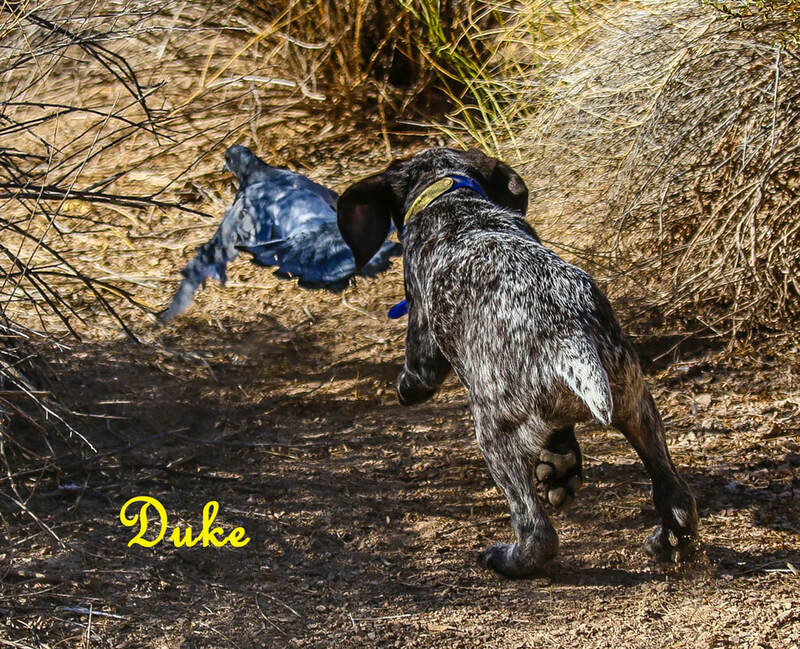 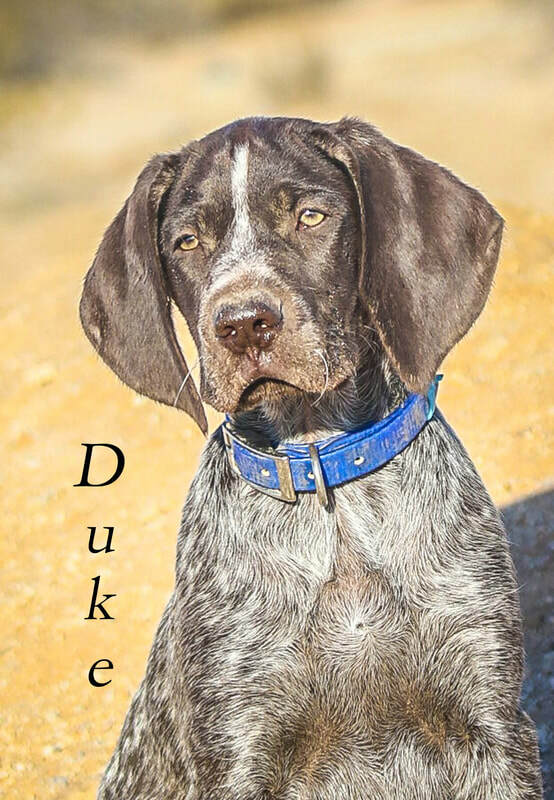 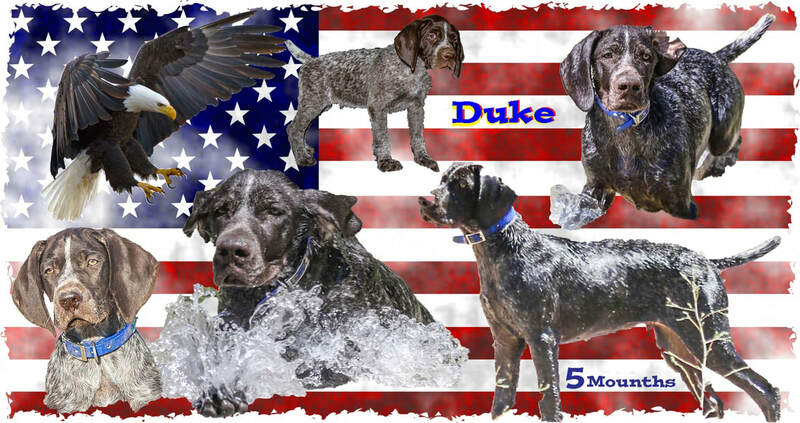 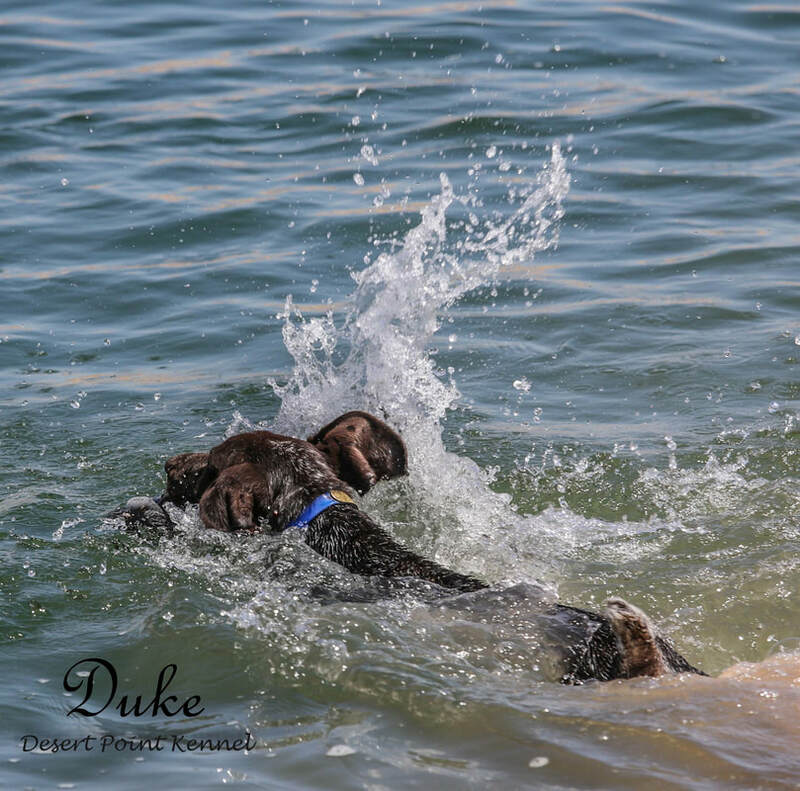 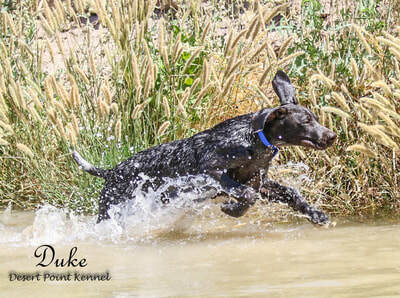 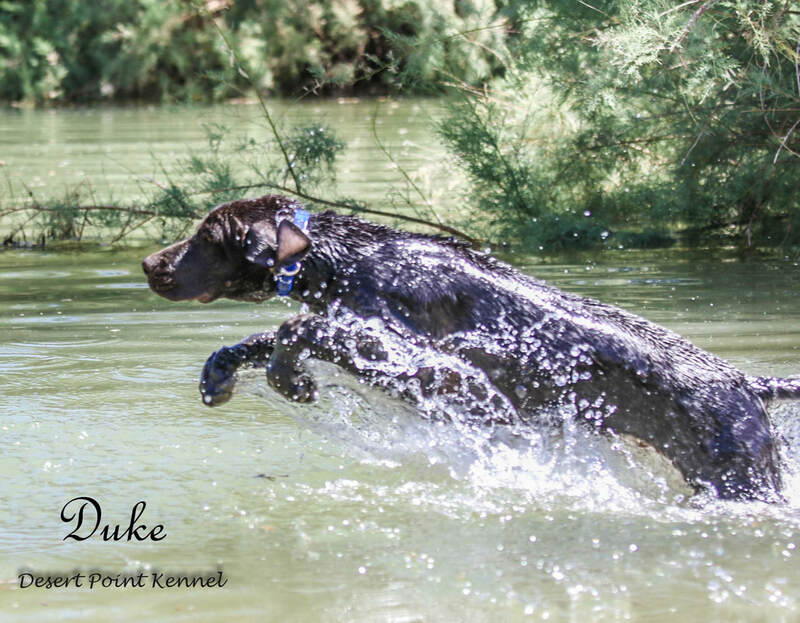 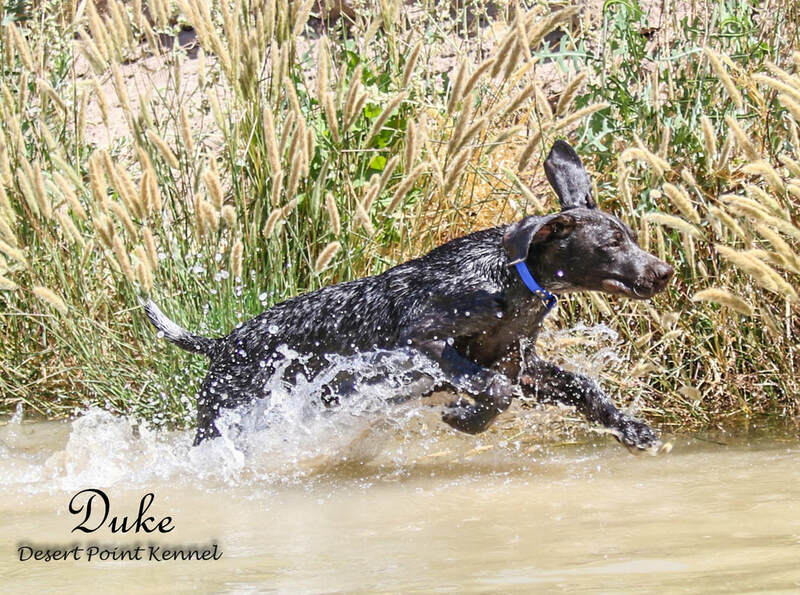 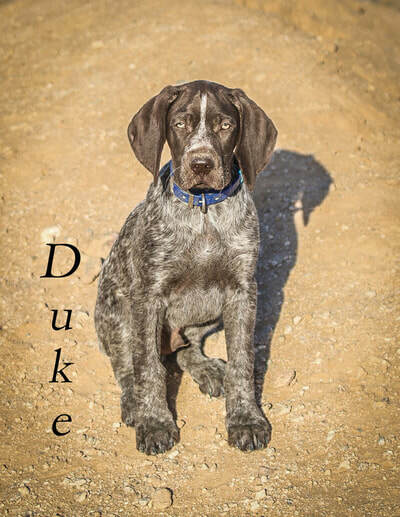 Duke is a blend of a few different lines we have been using. We had used American Field type dogs but the ones coming white lacked the water and retrieve we were looking for, and quite often they were working out to far. 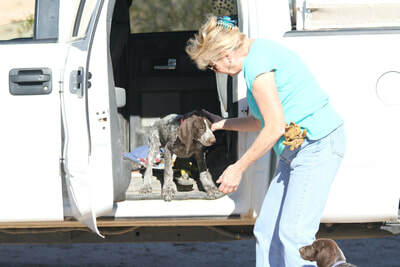 We then tried some German American lines with some of the black lines and they worked out about right. 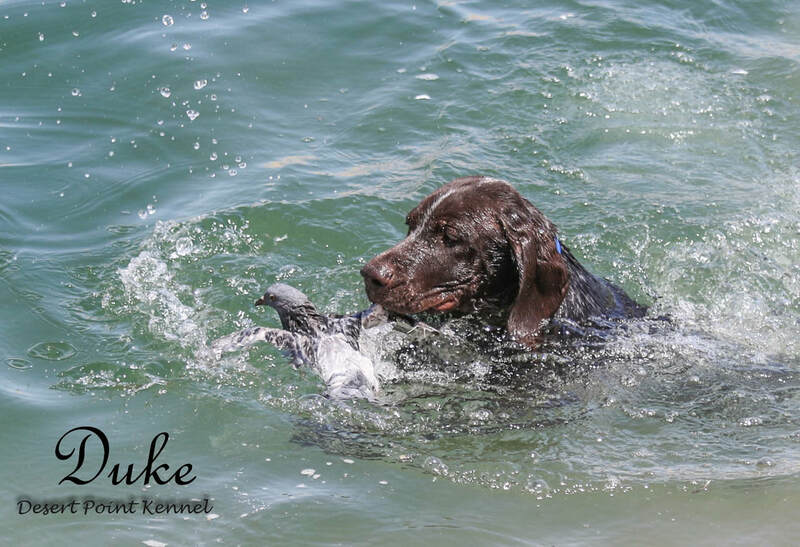 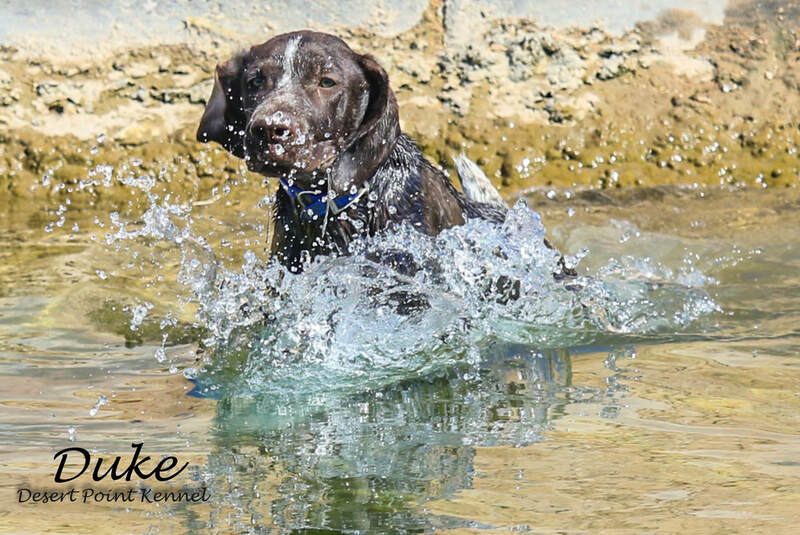 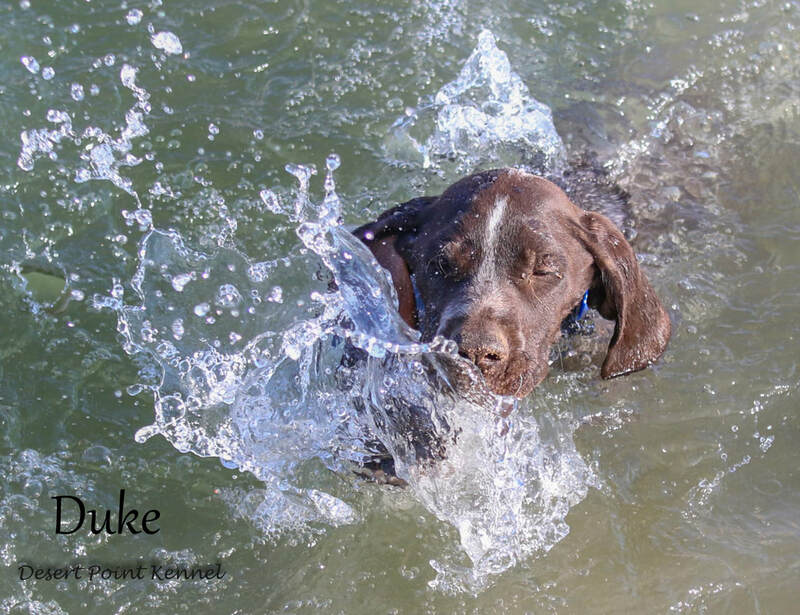 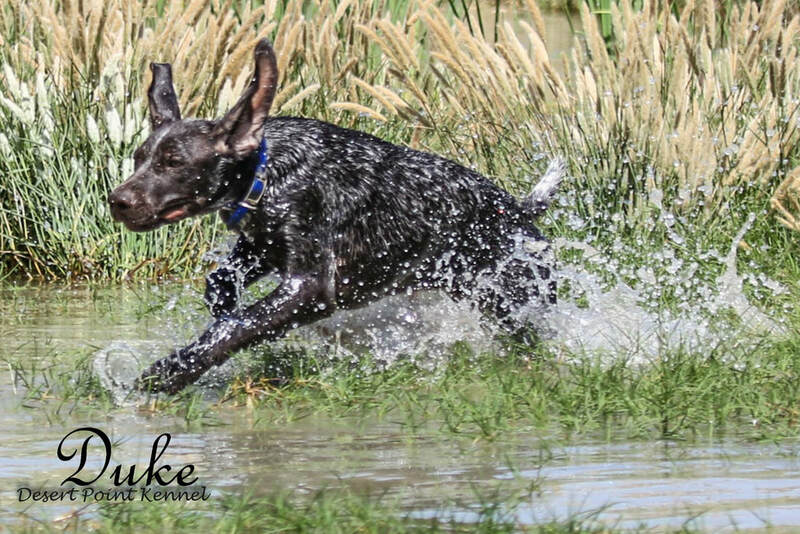 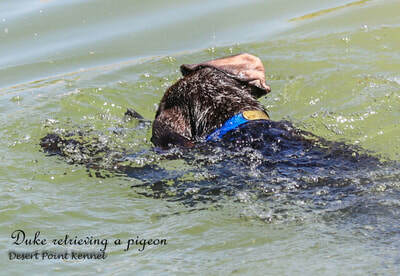 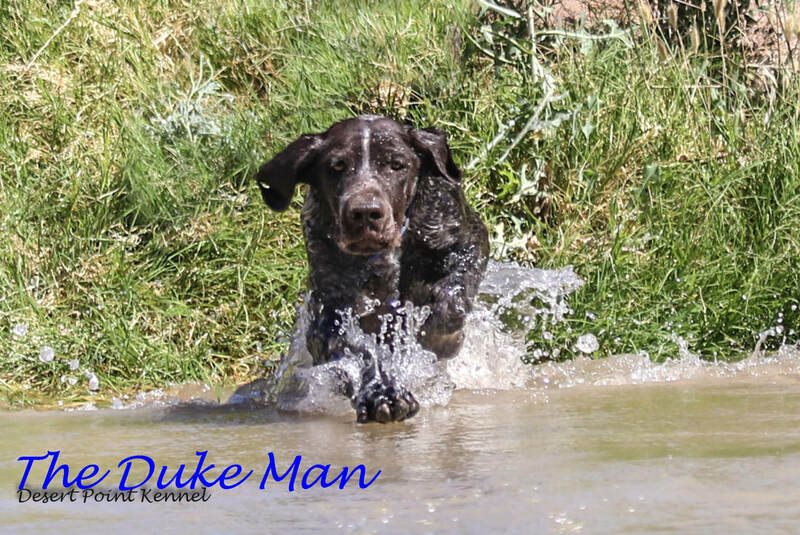 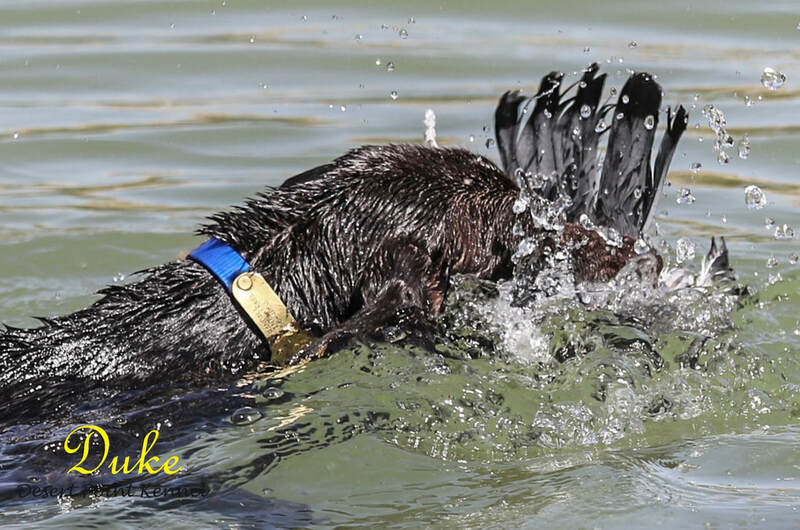 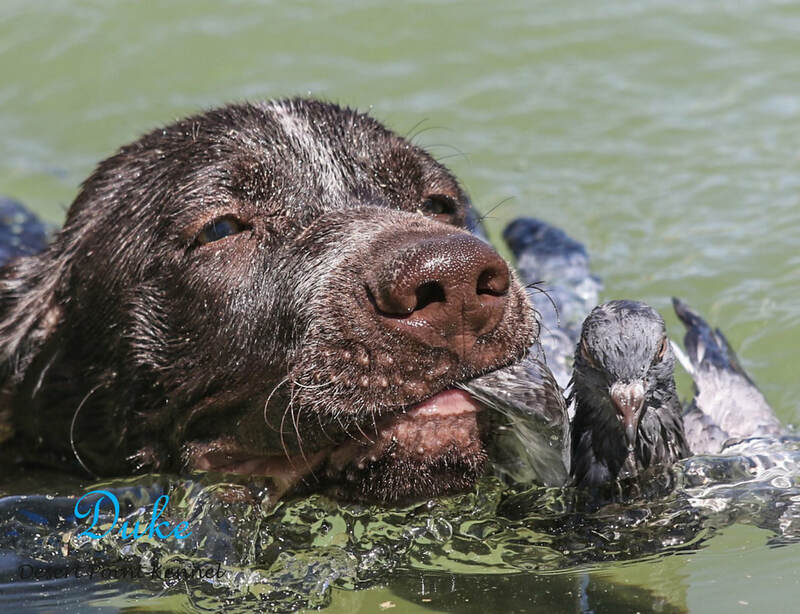 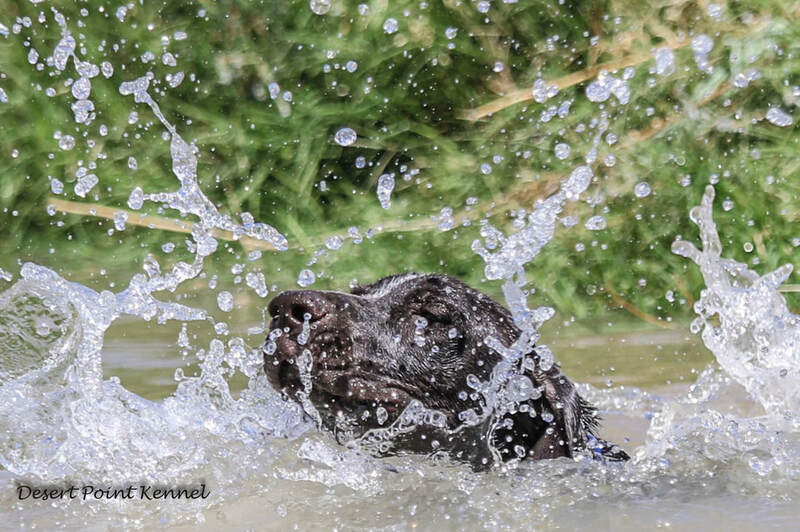 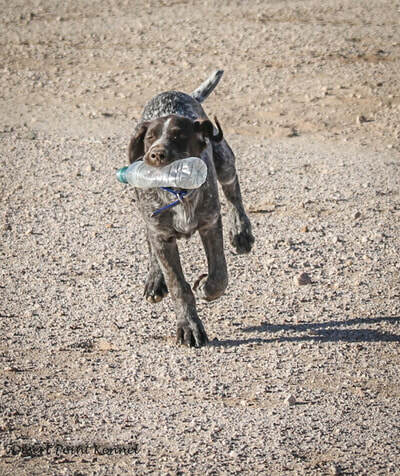 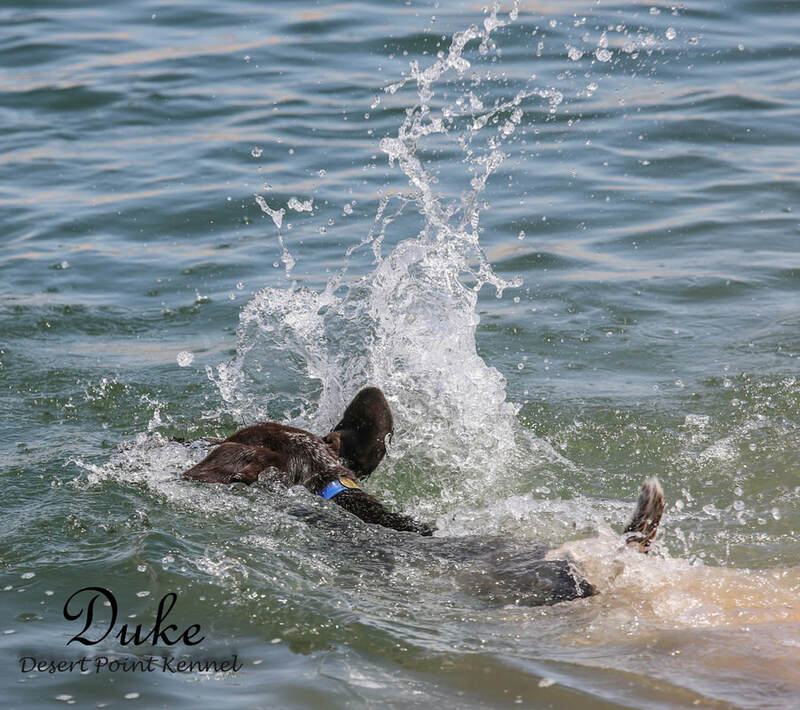 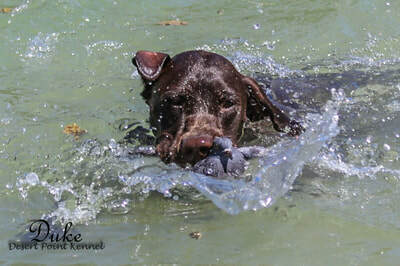 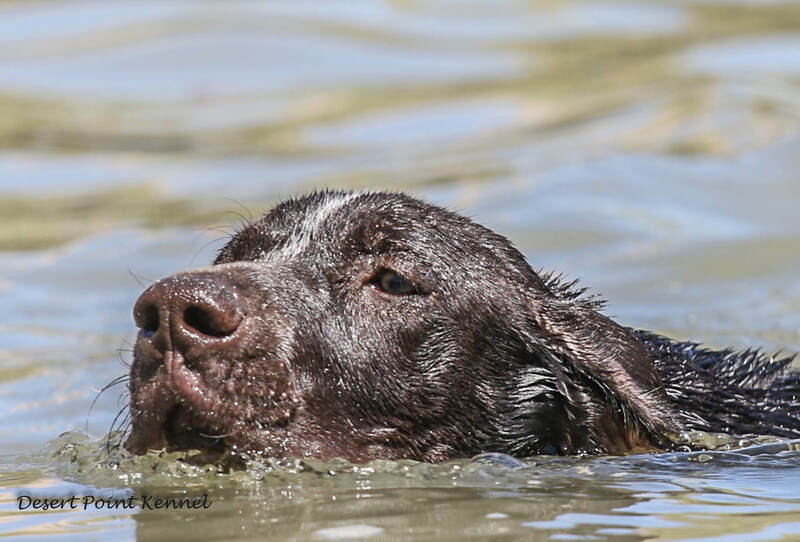 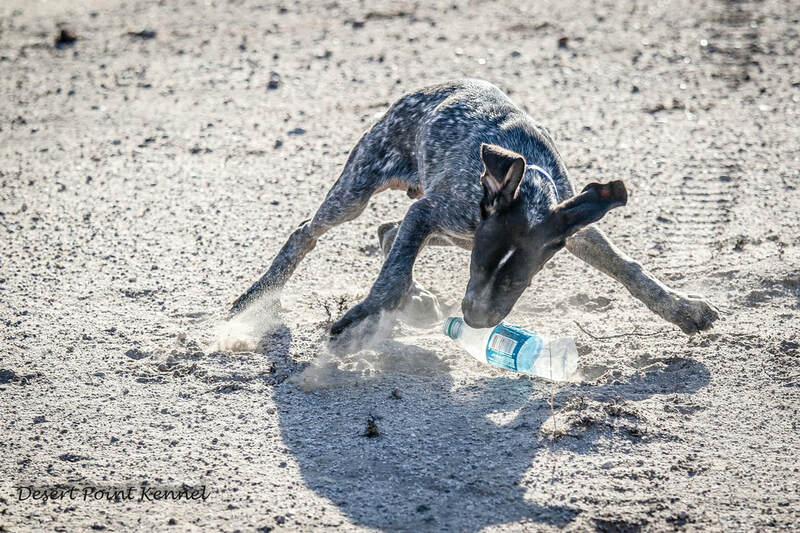 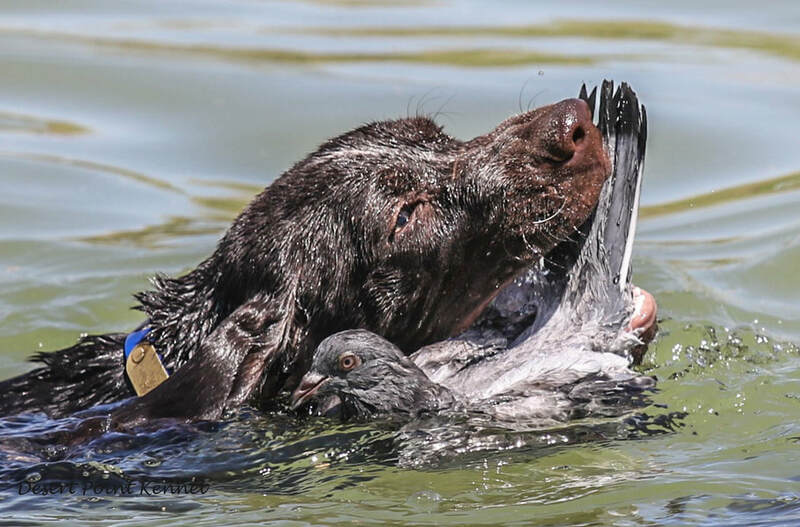 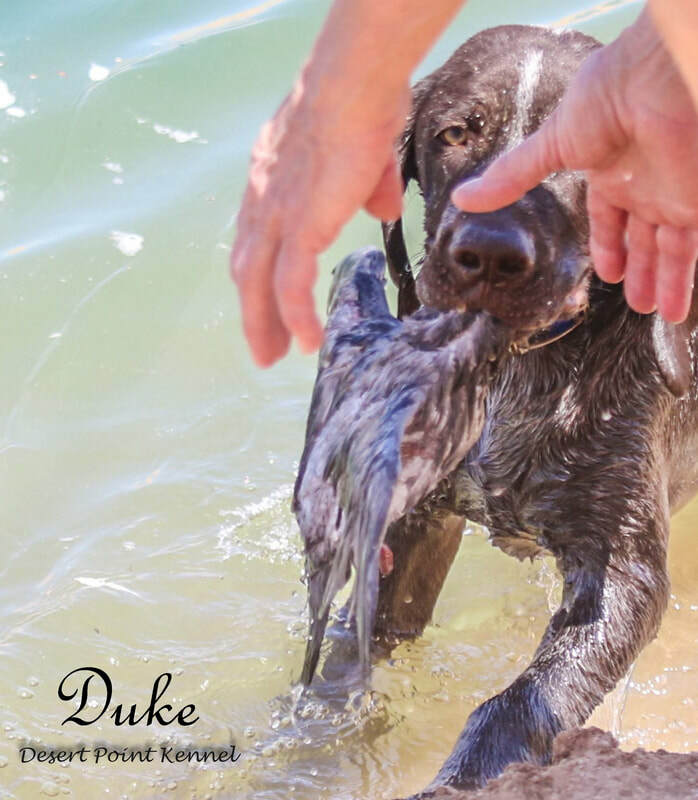 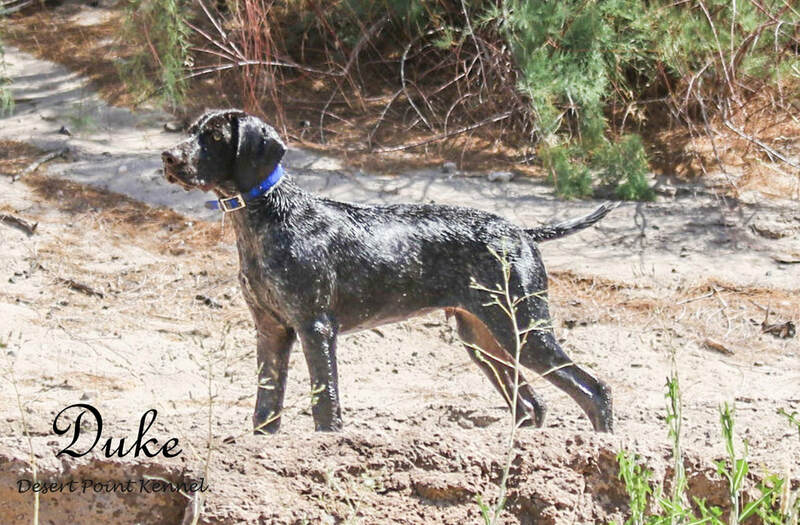 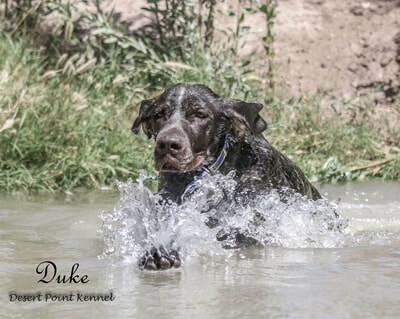 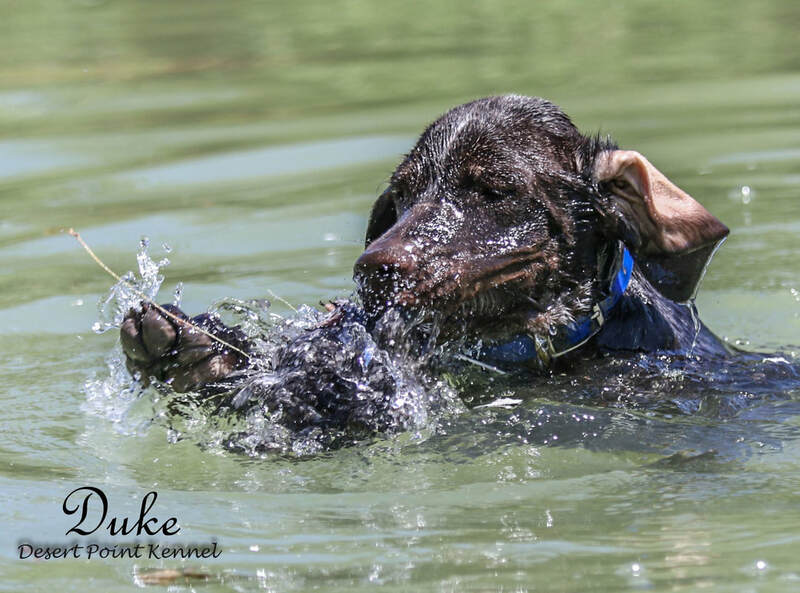 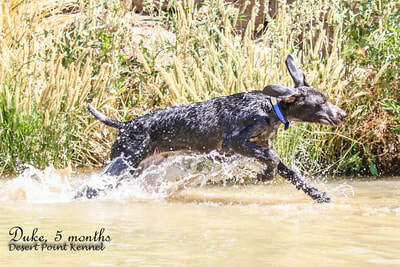 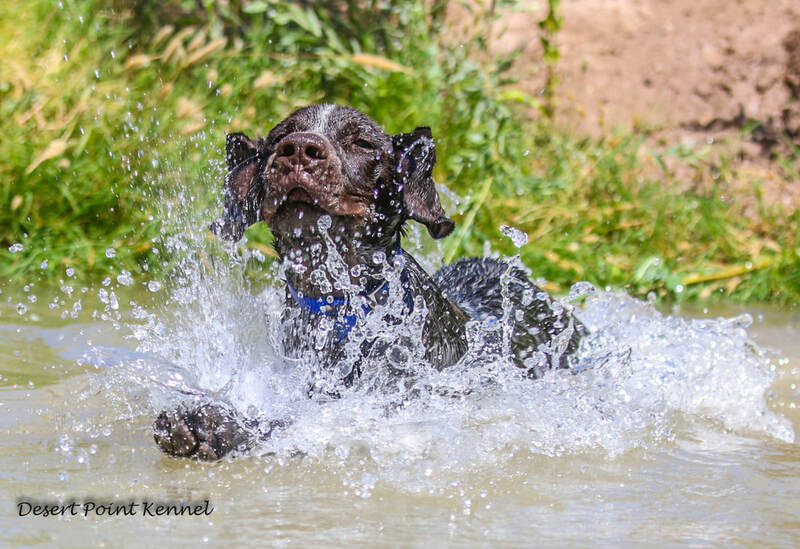 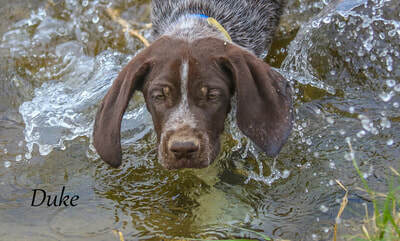 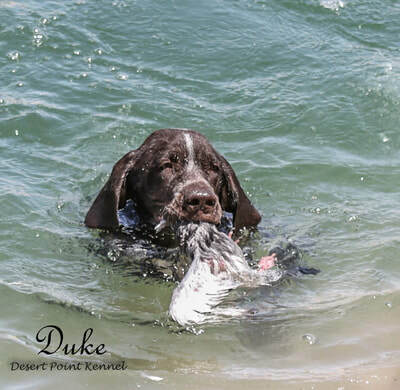 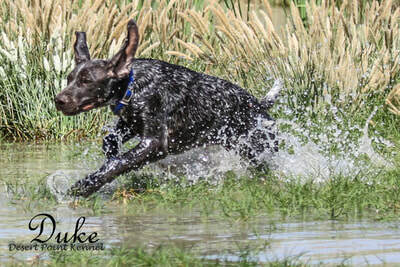 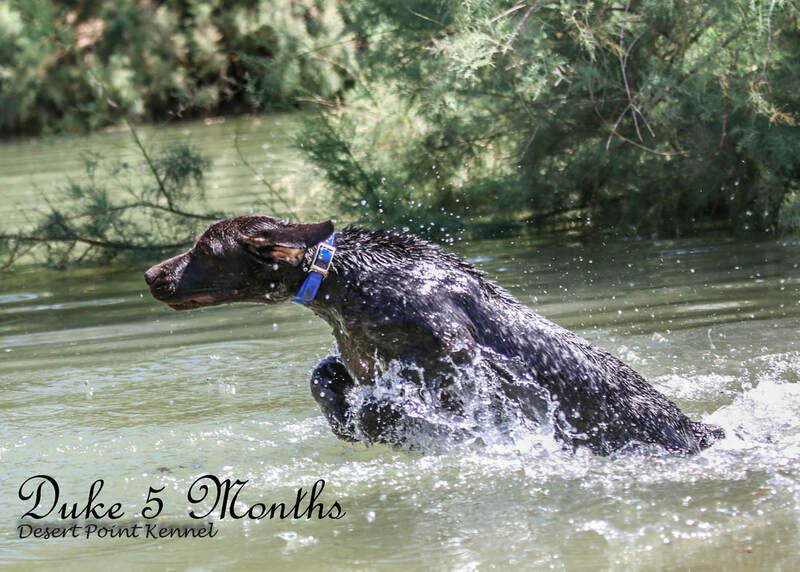 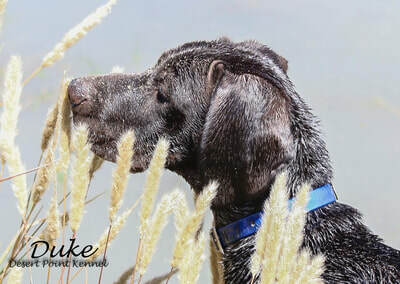 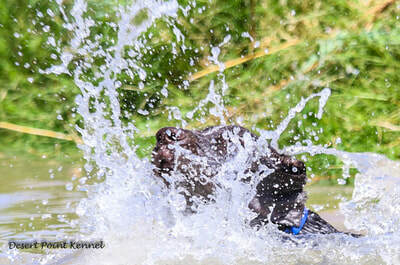 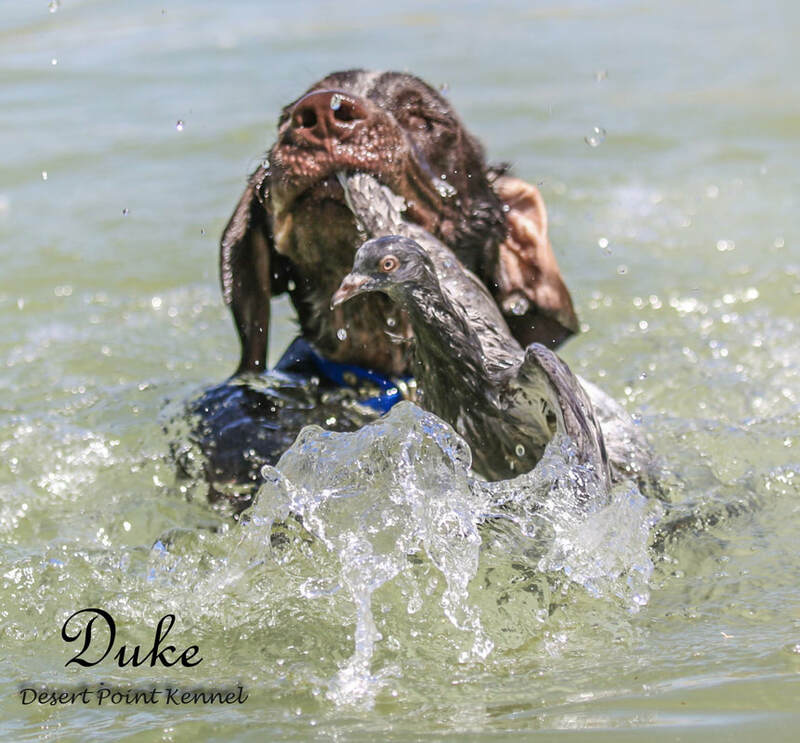 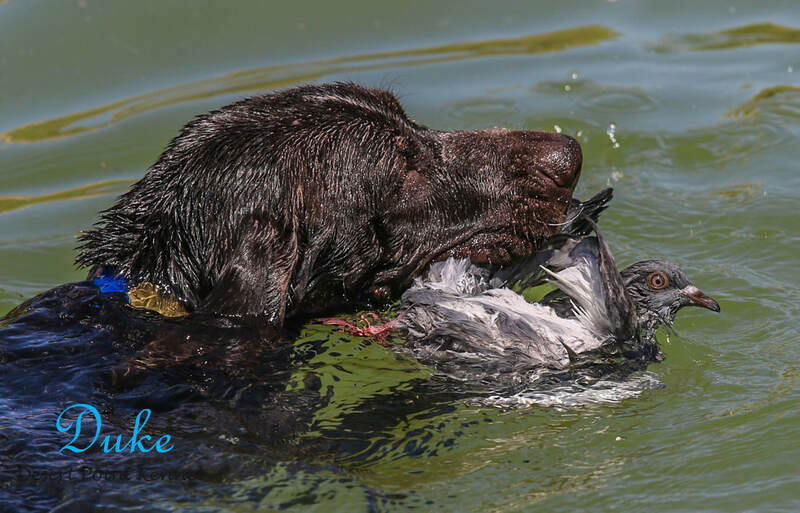 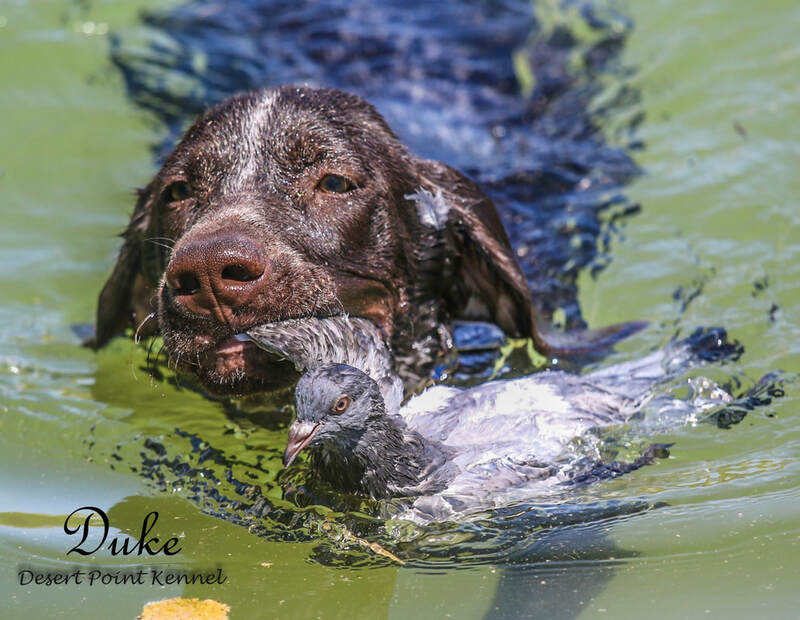 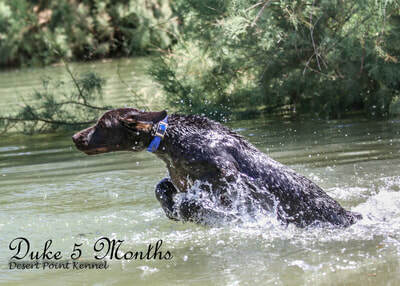 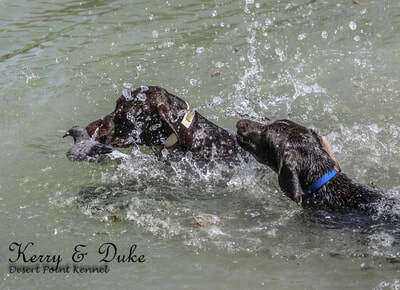 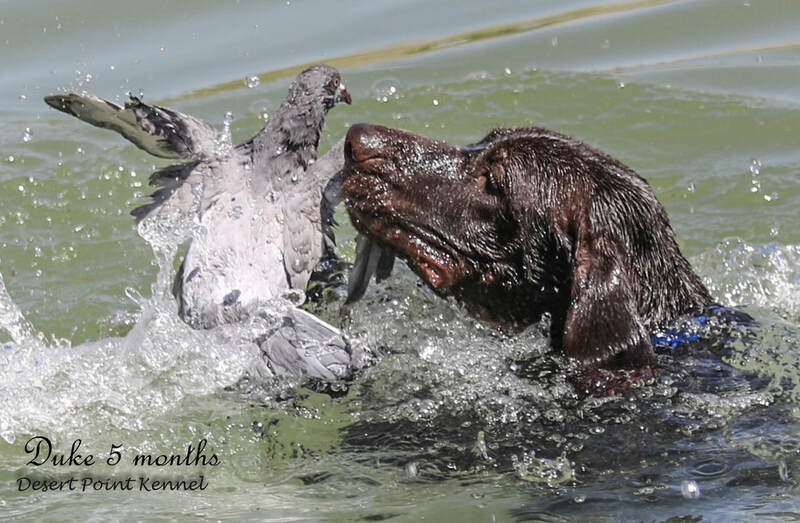 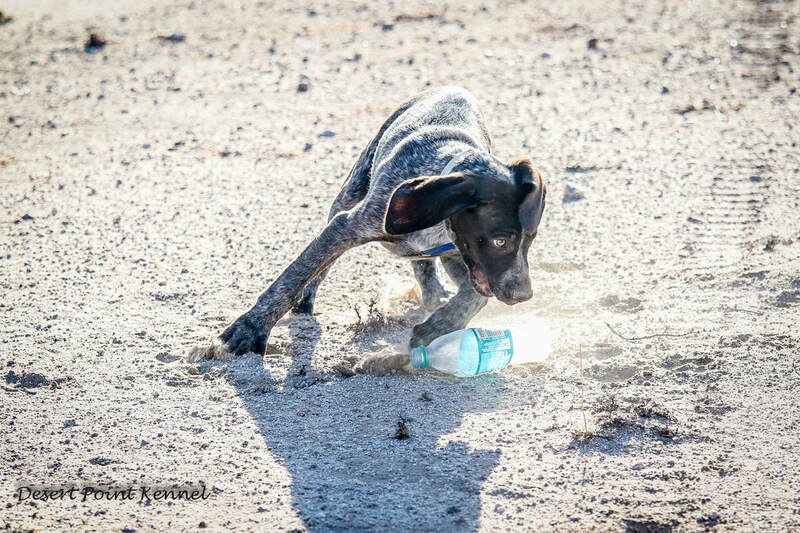 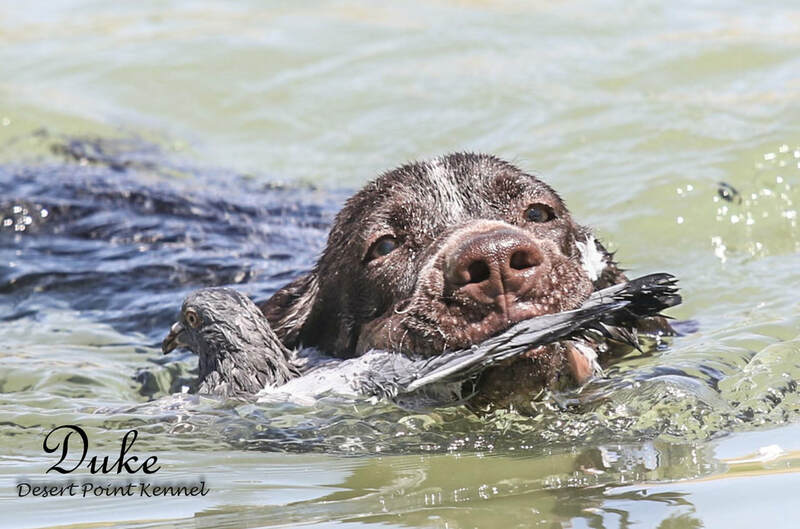 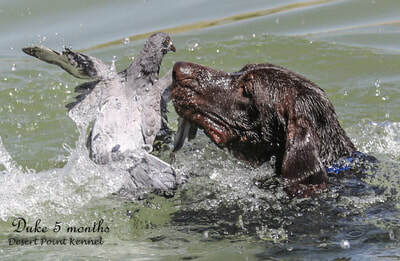 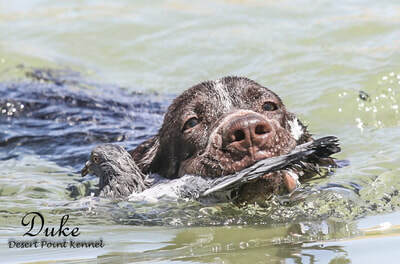 Good water, natural retrieve, worked with us in the field, good point and back and a great temperament. 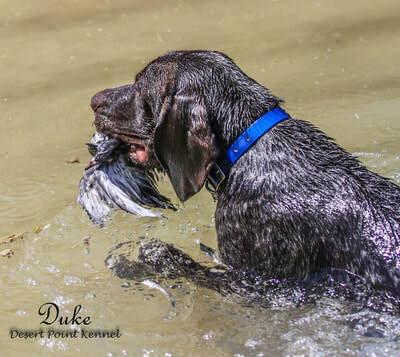 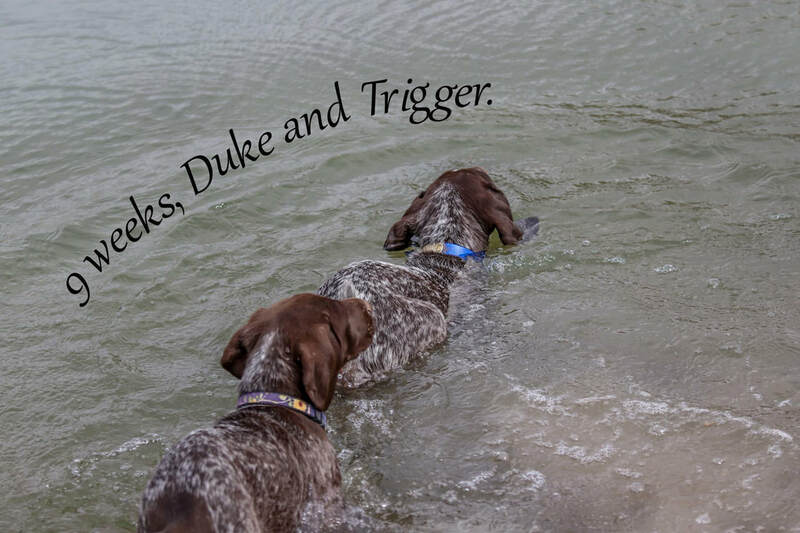 Then we tried pure DK's or German lines and got great drive, wonderful water work, nice natural retrieve but they were lacking in pointing and backing. 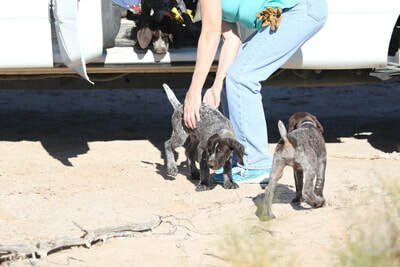 Then we came upon some older German American lines. 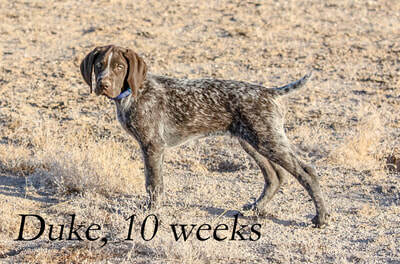 The verdict for us is still out. 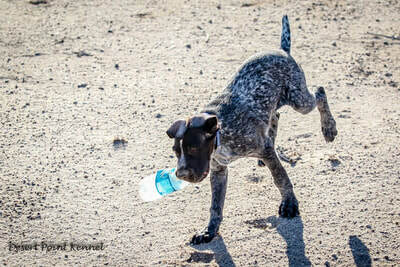 We are trying the lines pure and then blinded with what we already have. 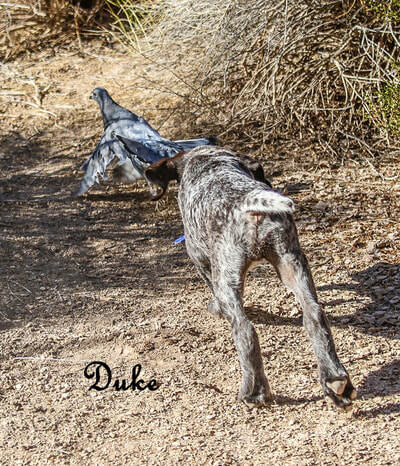 Duke is one of the blinded dogs. 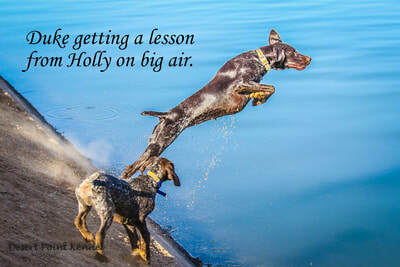 Meaning heavy in Hainsholz kennel dogs that are mixed with the likes of Hillhaven's Hustler, Stradivarius, that also has Hustler, and DC Hof Treeker V Gunbaum which is Hustler and Yoli Rothenuffeln. We took these lines and brought them back to the dogs that have been working well for us, which is Jack, David, and Katie's mother line Lacey, as well as Jill's. 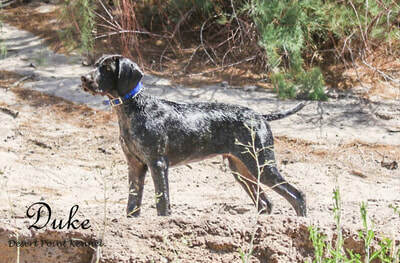 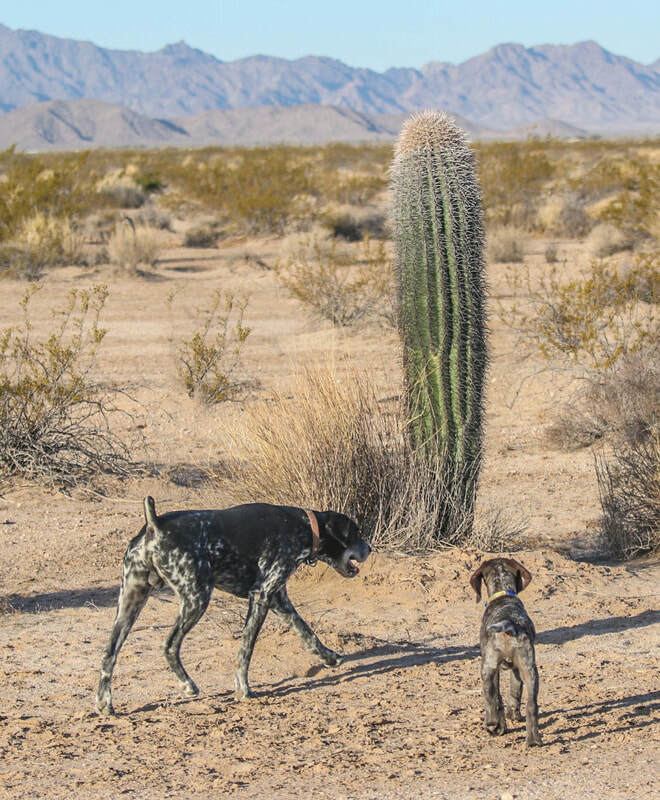 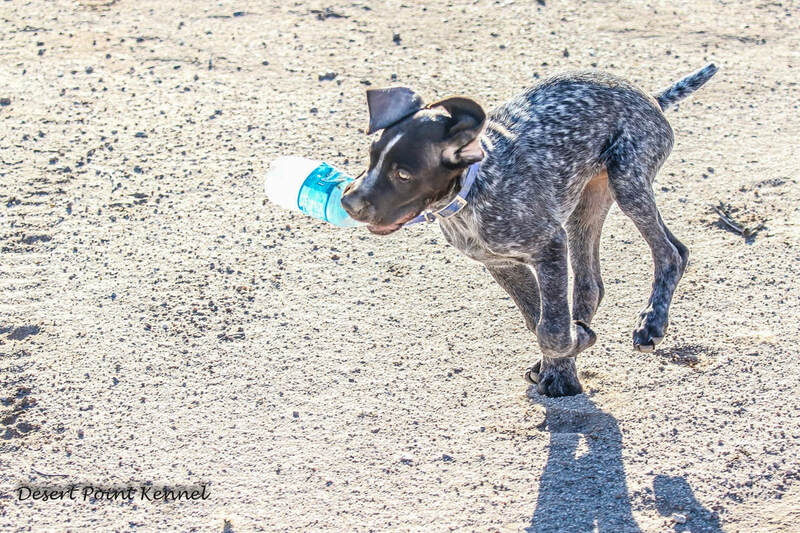 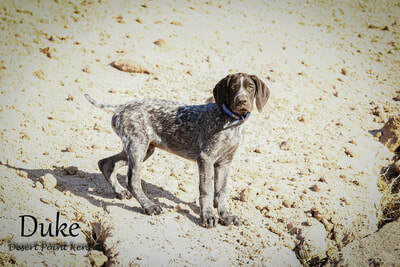 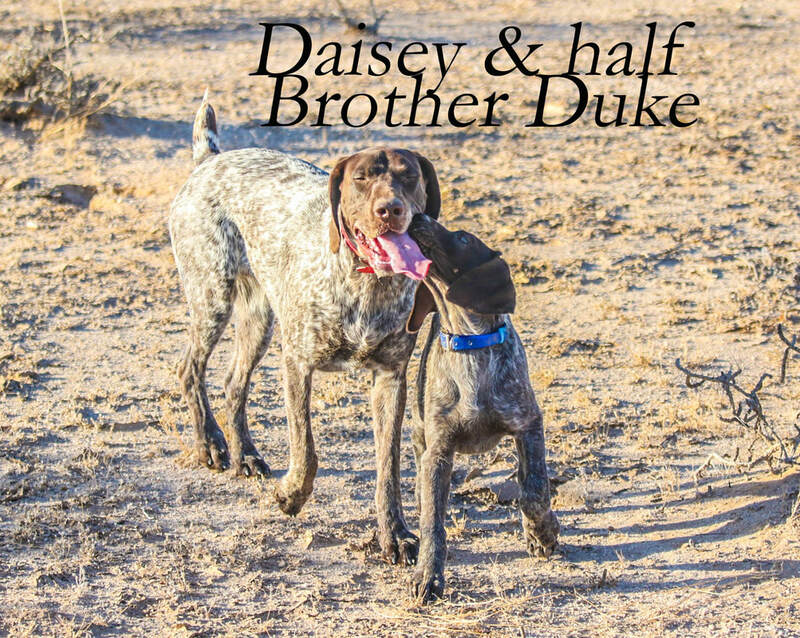 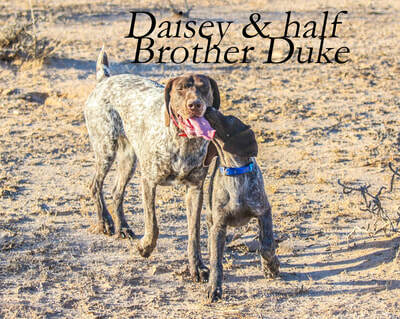 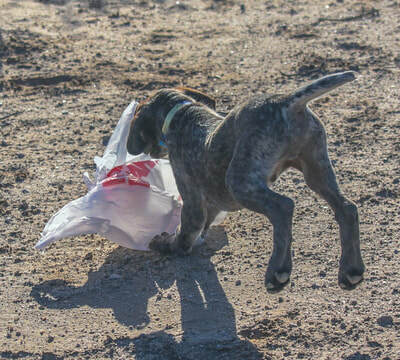 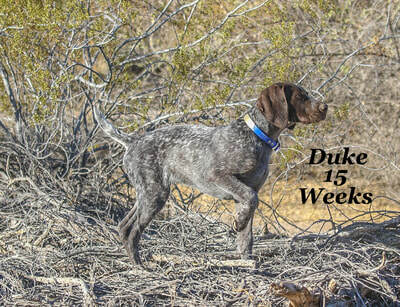 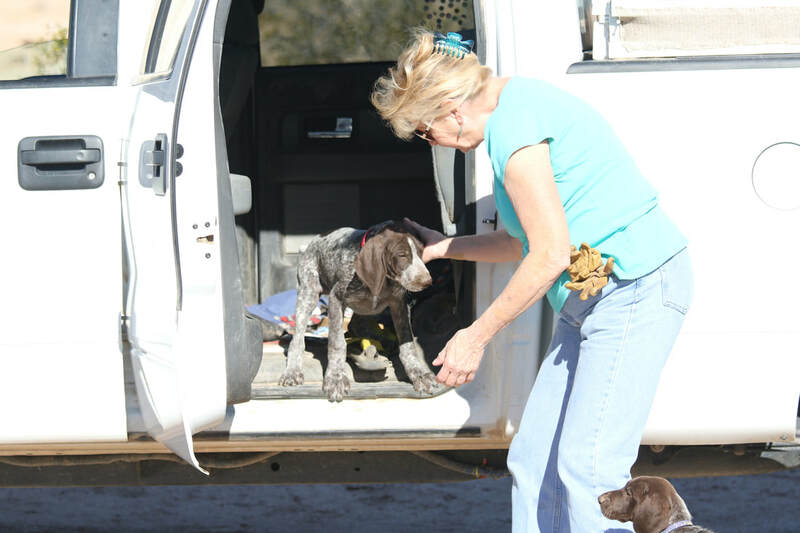 That with a dash of field trial dogs that have been filtered through good versatile hunting dogs like Dolly and Lady. All of that to get us to Duke. 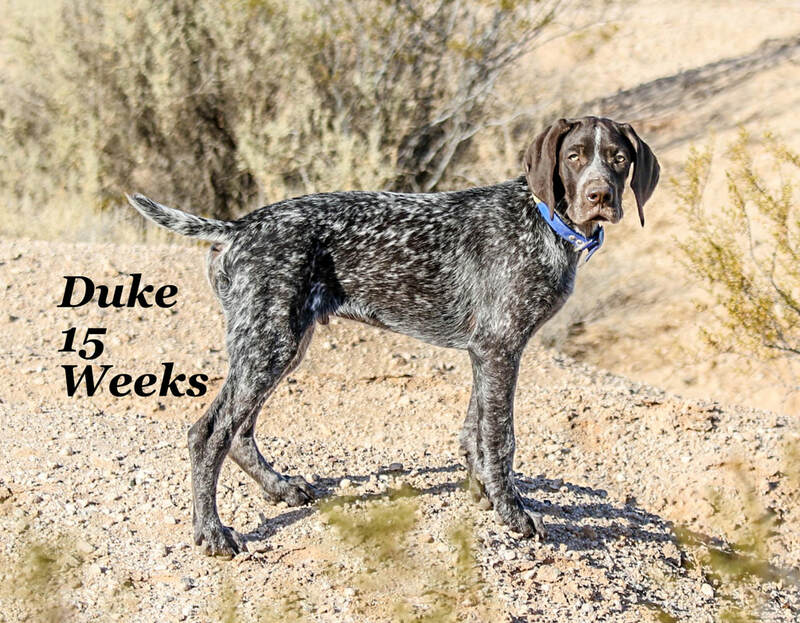 So let's keep and eye on Duke. 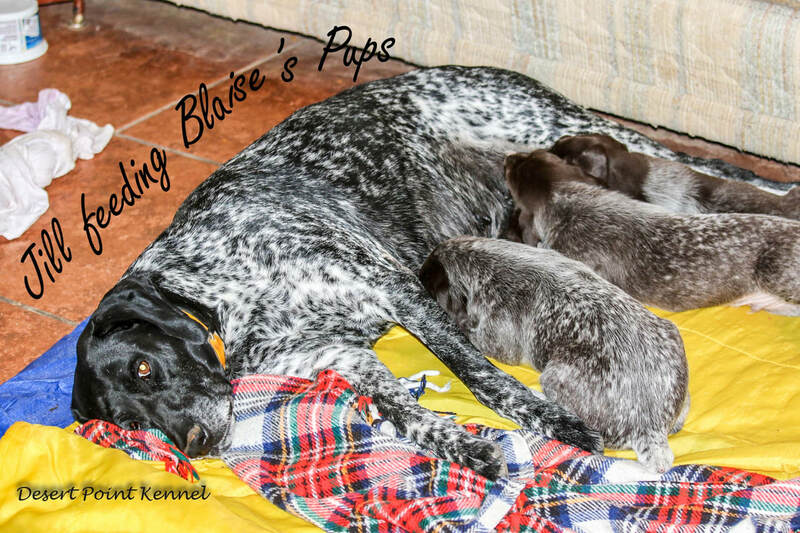 Dukes mother Blaise is also such a cross. 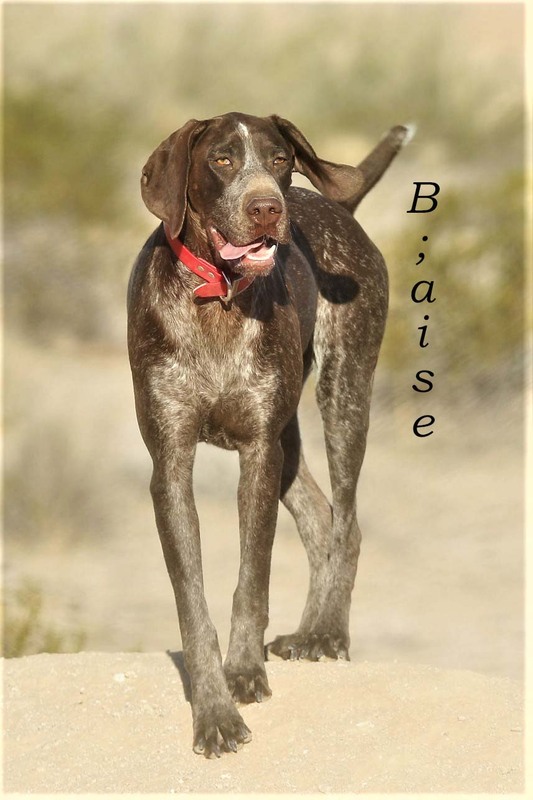 Bajenks crossed to Tonya gives us Blaise. 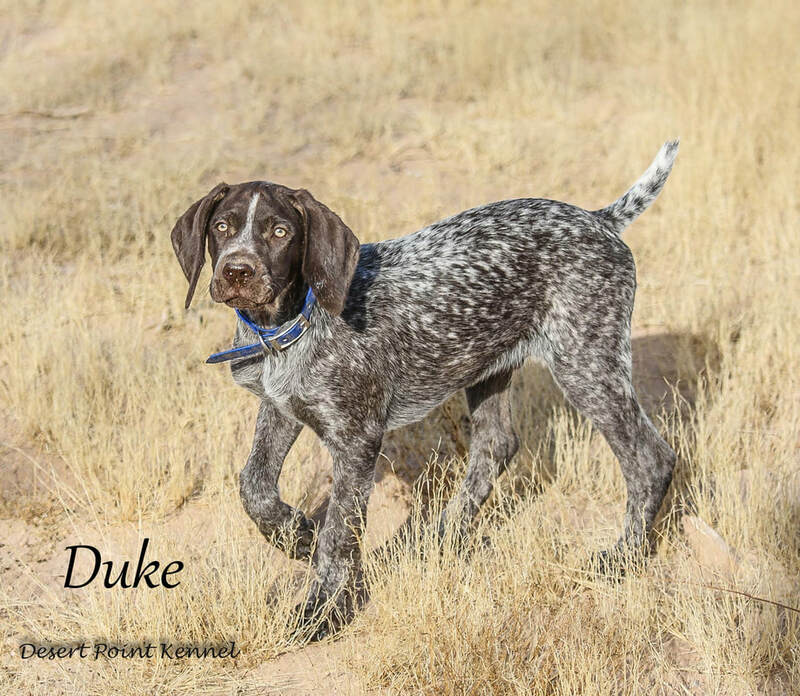 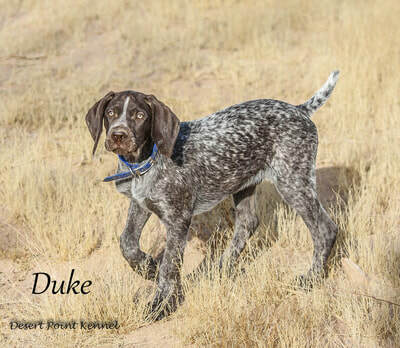 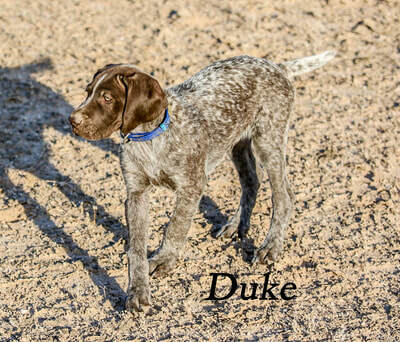 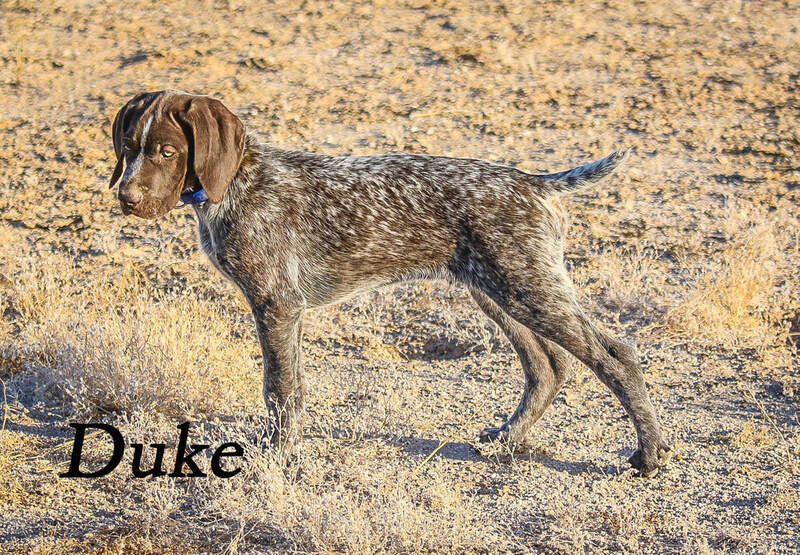 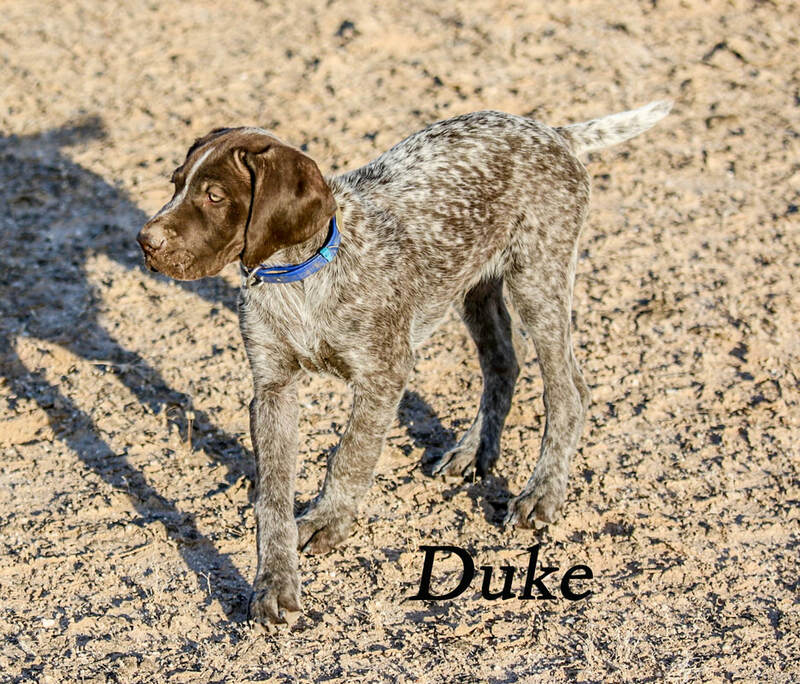 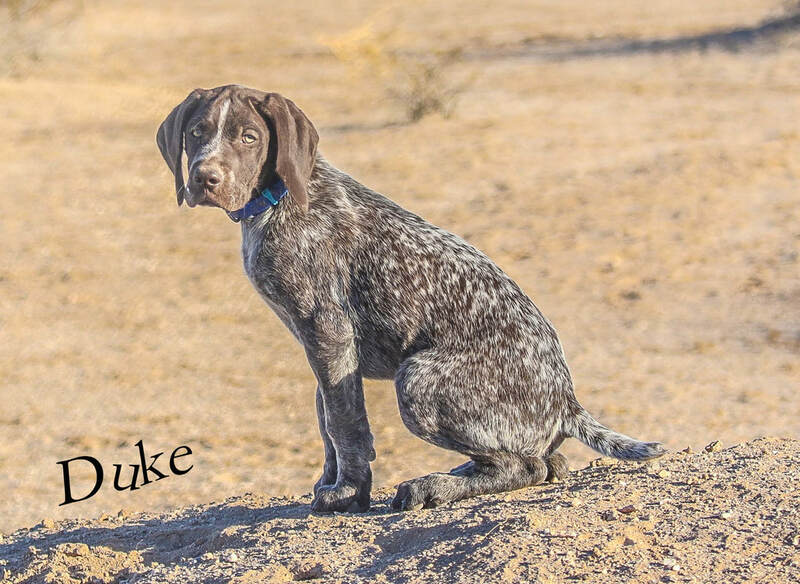 Blaise crossed with Scout gives us Duke. 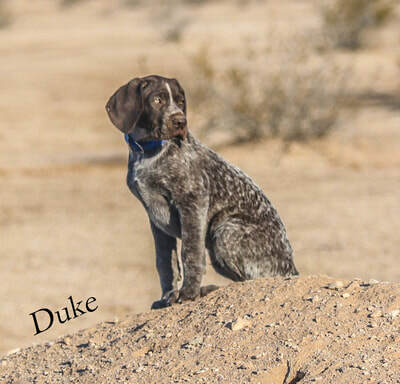 A real 2nd generation of this blended breeding. 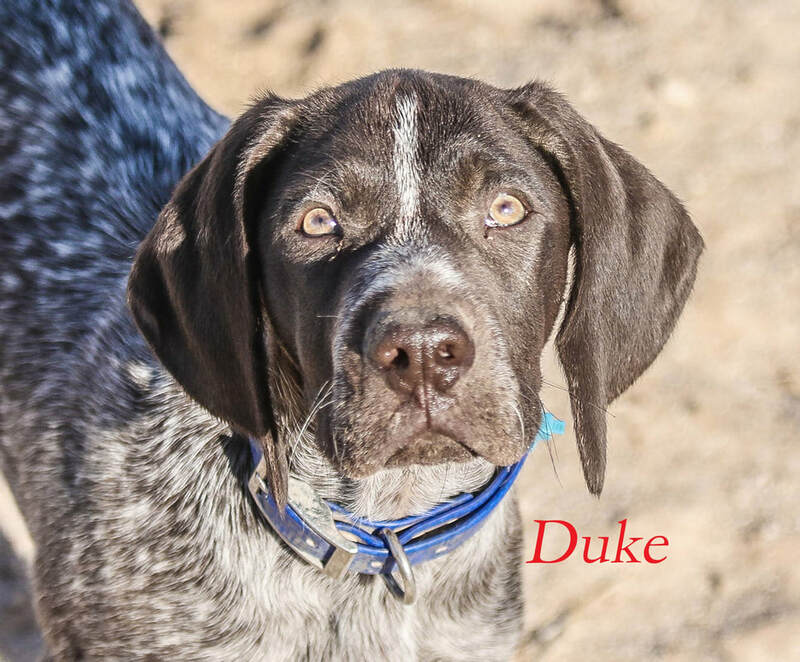 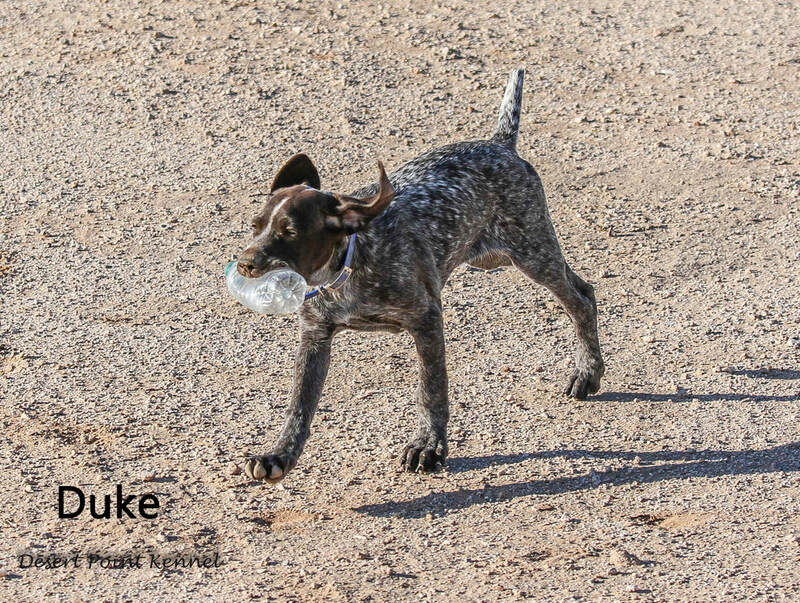 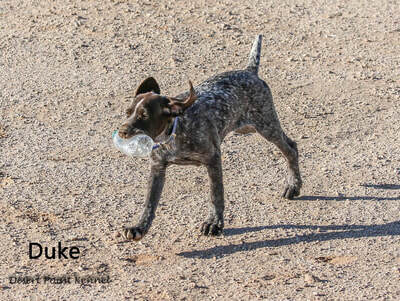 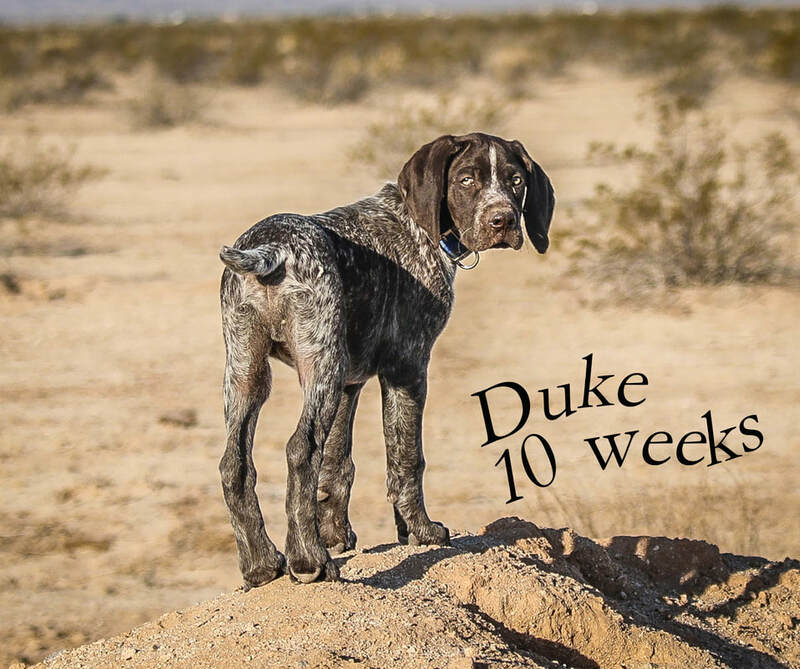 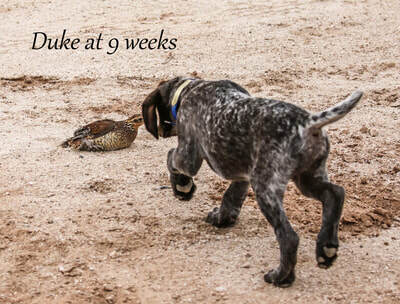 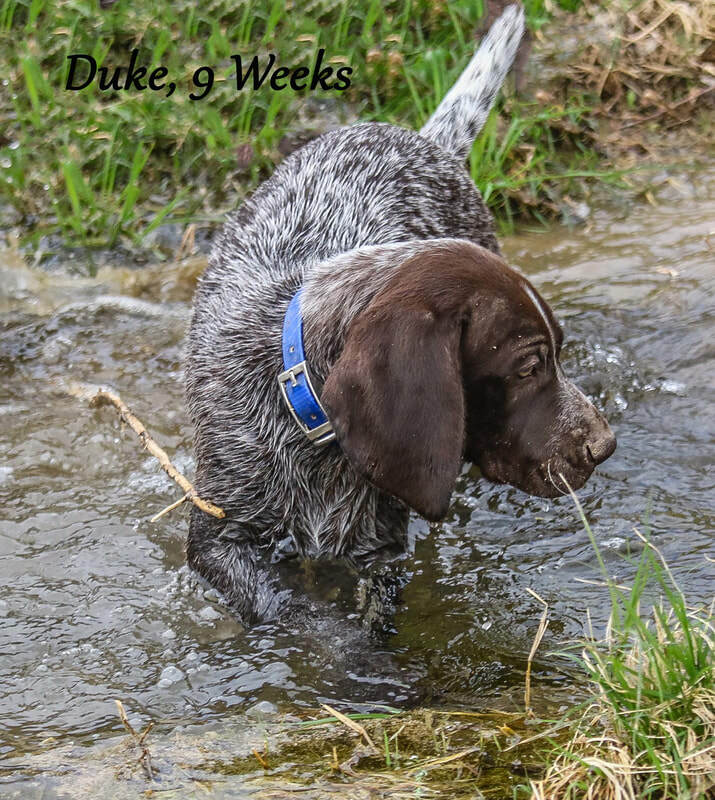 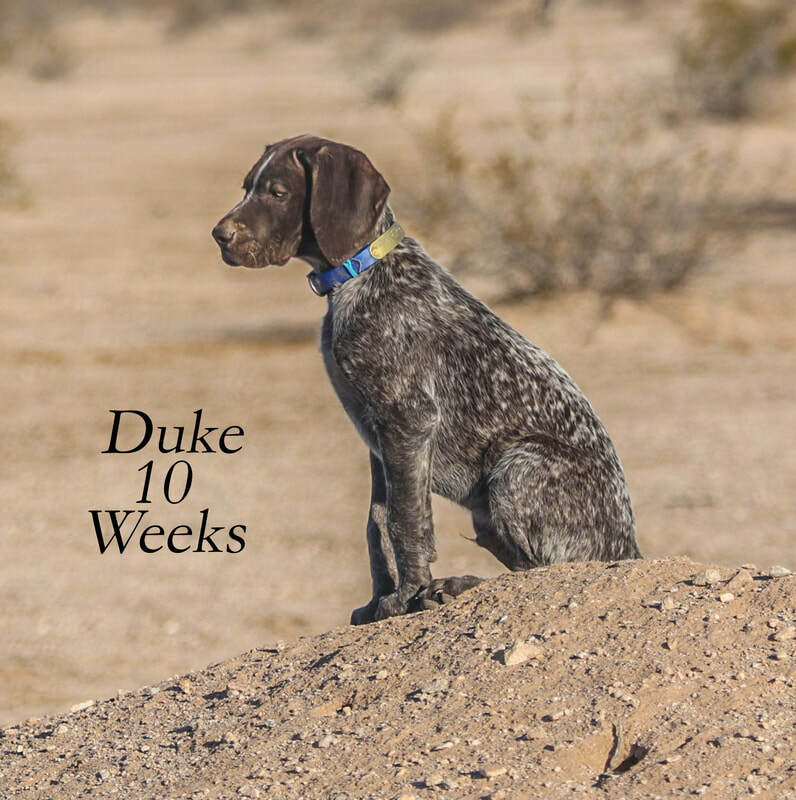 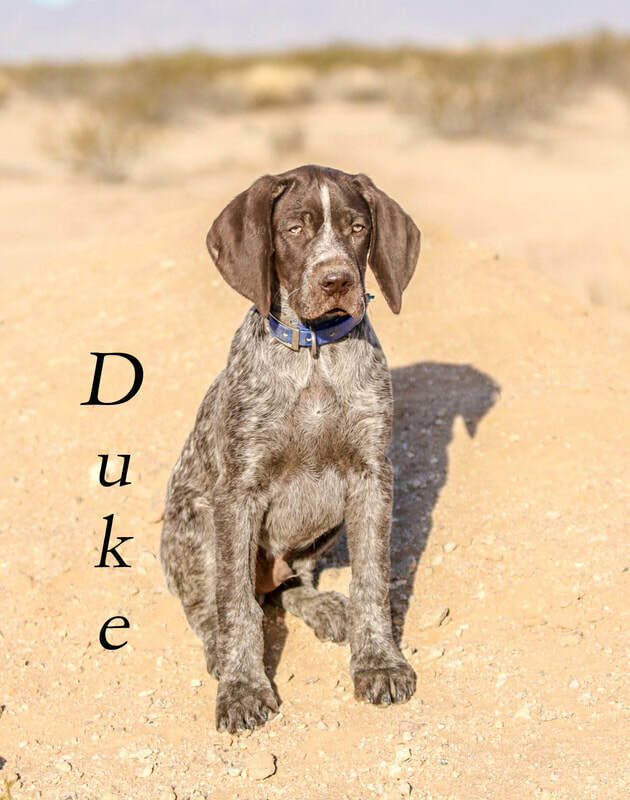 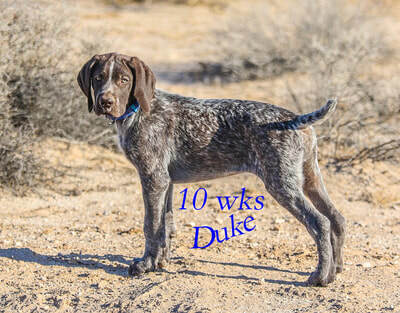 Duke is a puppy at the time of this writing March 2018. Duke was born 12-23-17. 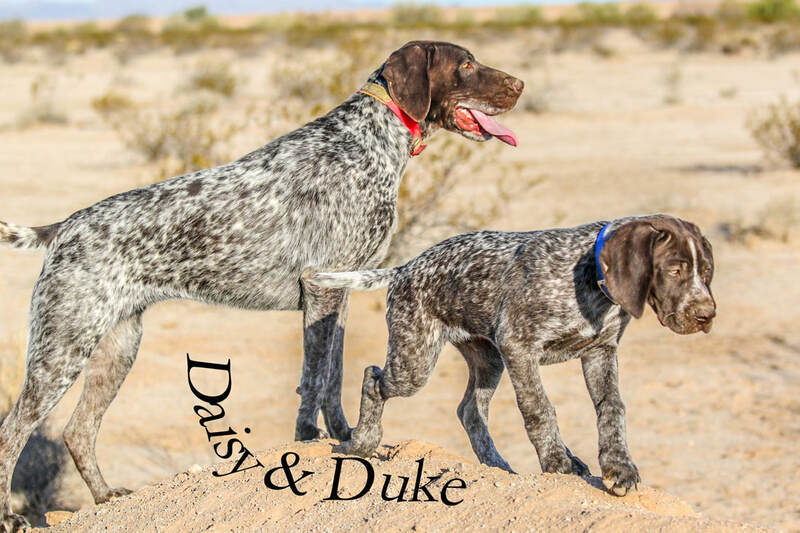 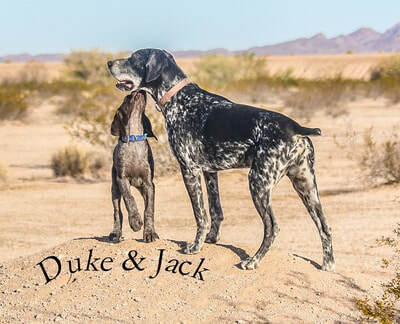 Dukes sire is Scout, and his dam is Blaise. 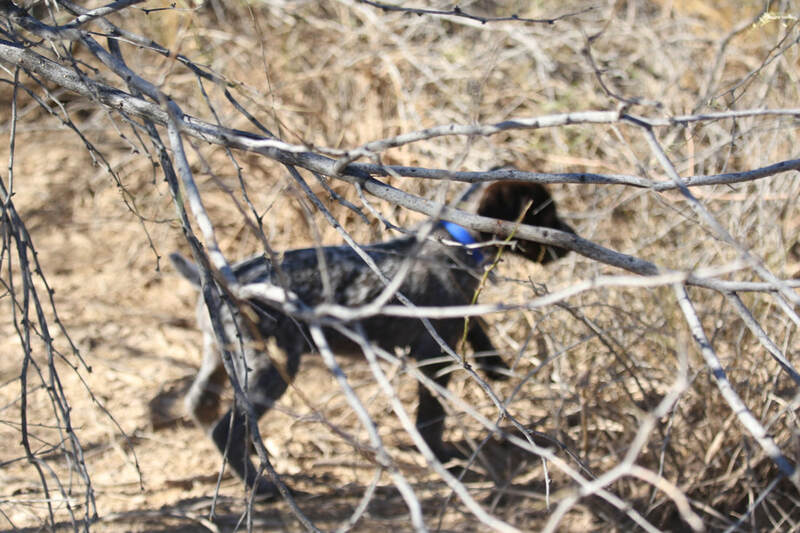 Blaise is out of Bajenks and Tonya. Bajenks is out of David a half brother to Jack. Bajenks mother is Vera out of Jack and Dolly. 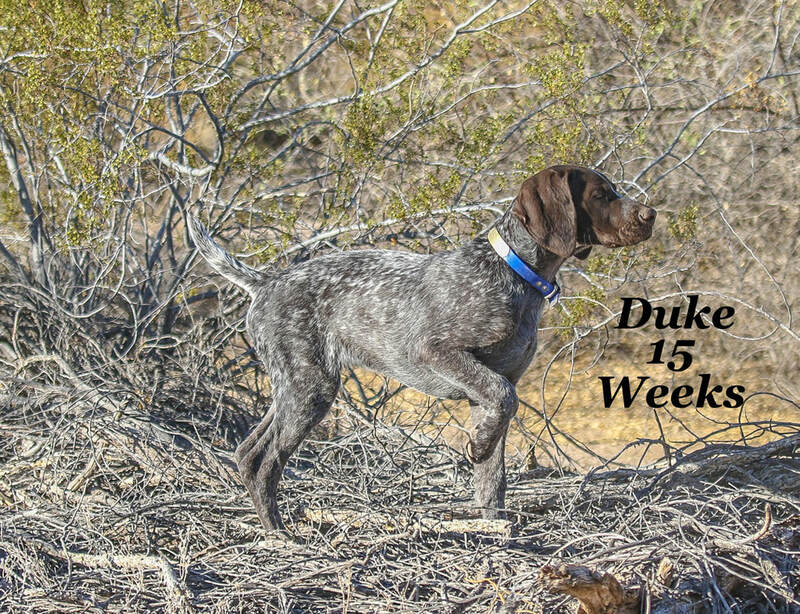 Duke did outstanding in his puppy test at 7 weeks. 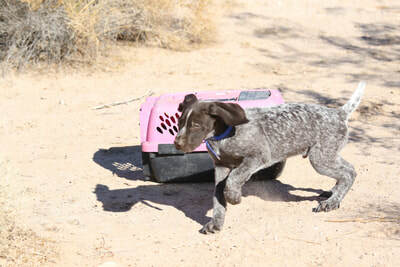 He is outgoing and bold. 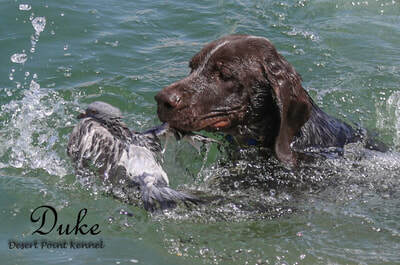 We have already been working him on birds and getting him on outing and to the water. 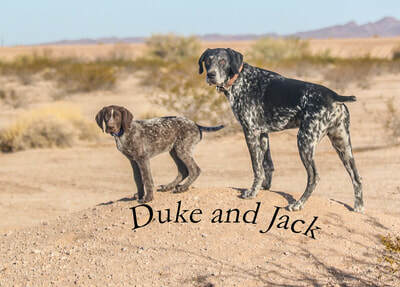 This blend of Scout and Tonya's lines with our Jack and David lines is what we have been working on. 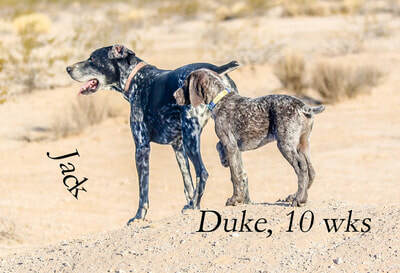 Blaise is the mother of Duke. 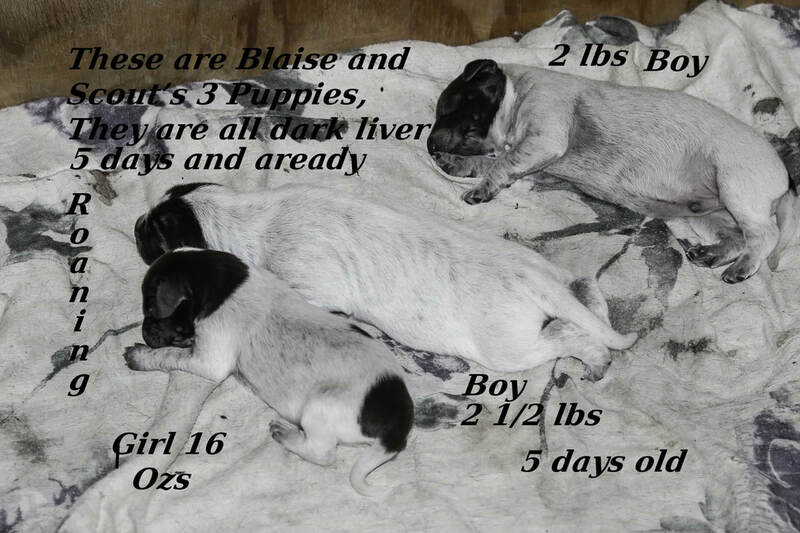 Blaise's mother is Tonya and father is Bajenks. Tonya is a half sister to Scout on their mother's side. 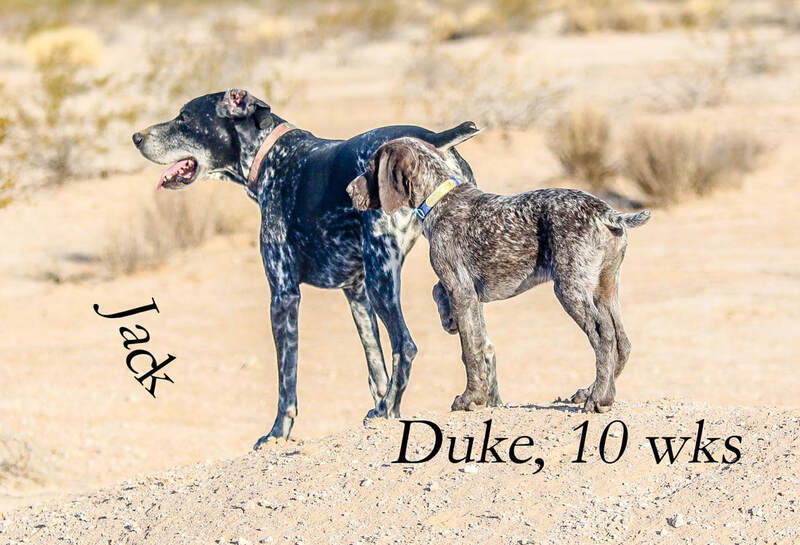 Bajenks is out of David who is half brother to Jack. Jack and Dolly are great great grandparents. 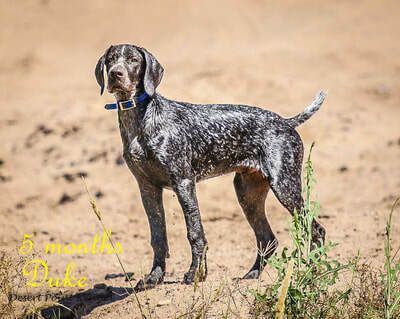 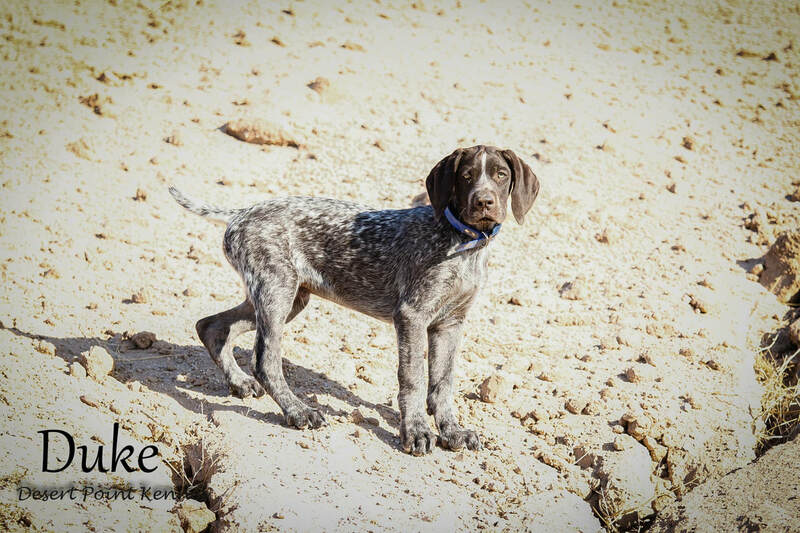 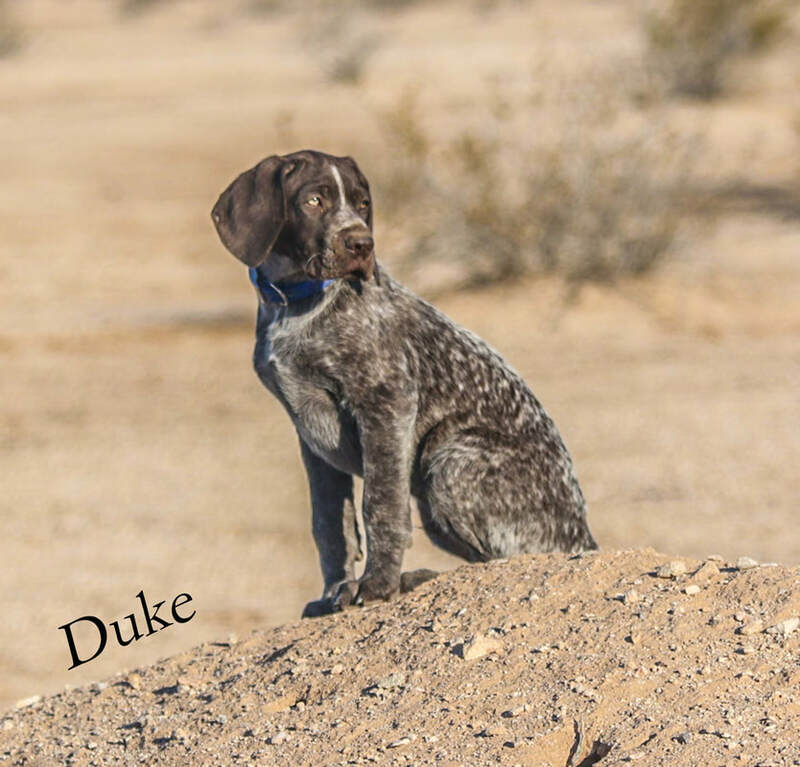 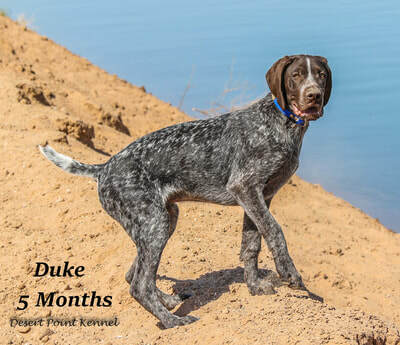 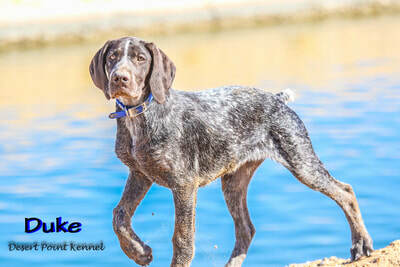 Scout's sire is 100% Hainsholz Kennel breeding. 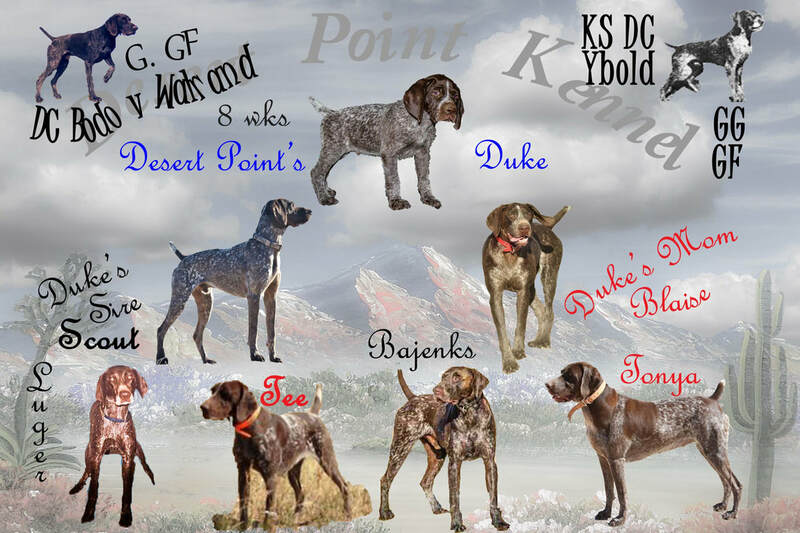 His father Luger brings both DC Bodo Walrand's and DC KS HOF Ybold Rothenuffeln's lines together. 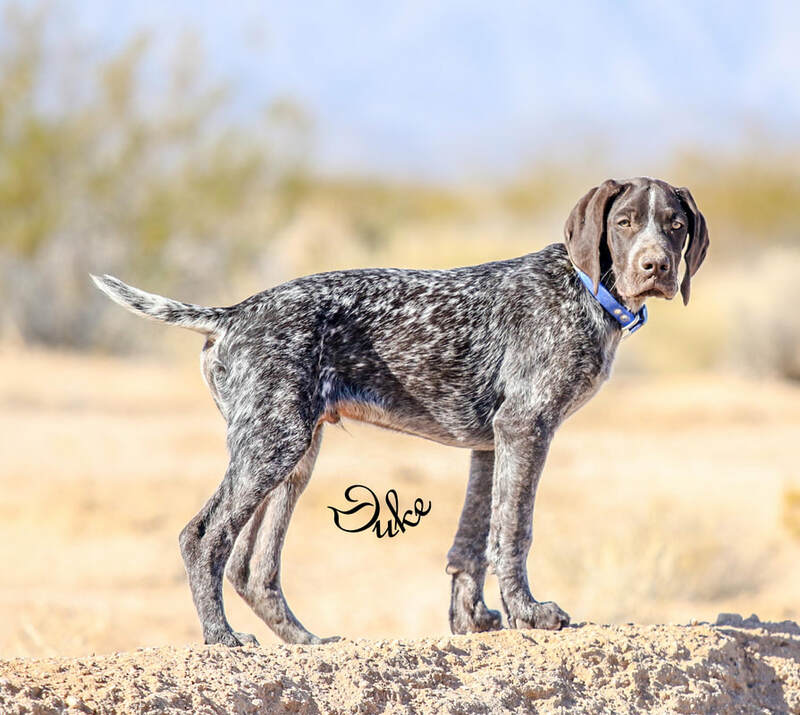 Scout's grandsire DC Bodo is the last German import to receive an American Dual Champion. Scout's Great grandsire DC KS Ybold is the only dog to hold a German KS Championship, and an American Dual Championship. 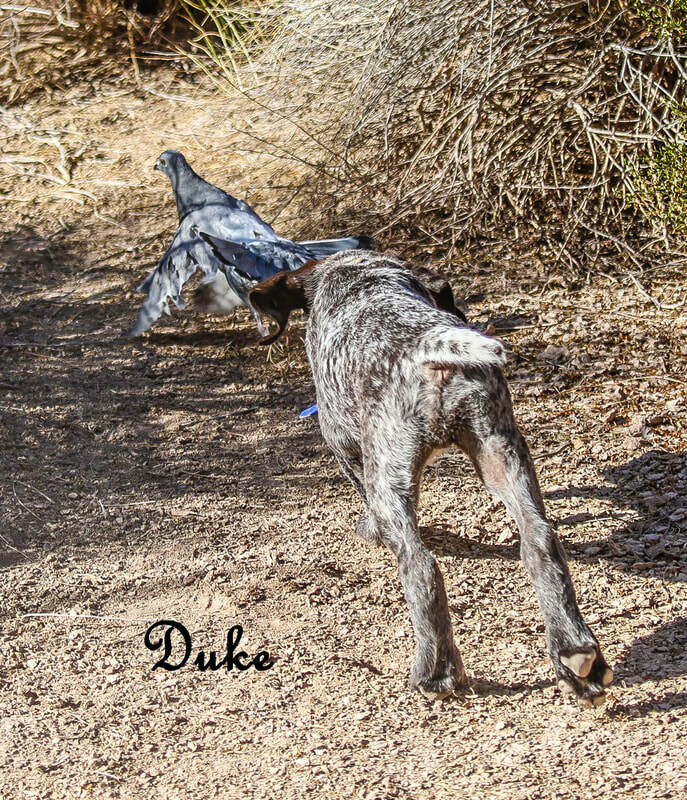 Scout's bottom side reads as a whos who of great American lines. Scout's great grandsire is DC HOF dog Treeker V Grunbaum. 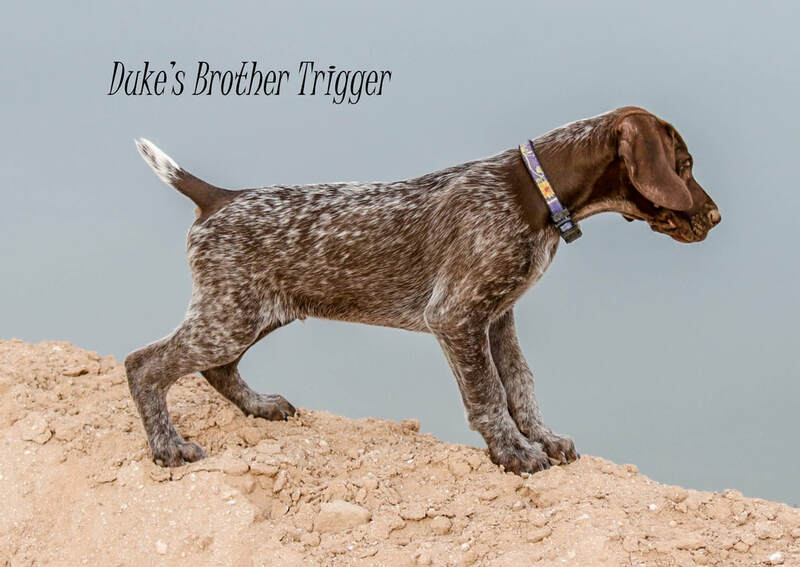 Treeker sire is the famous DC HOF Hillhaven's Huster. Treeker's Great Grandsire is Ybod's brother KS Yoli Rothenuffeln, once more bring those great lines closer. Then we see on Scout's very bottom the Stradivarius lines which are heavy in Hillhaven's. 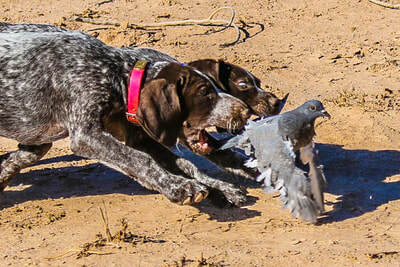 We also see Onyx and Elk V Hege-Haus, KS Orson Vom Pottsiepen, and Wasserschling. 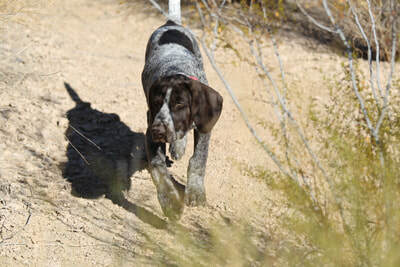 You will have to examine the full family tree of Scout to fully appreciate his ancestors. 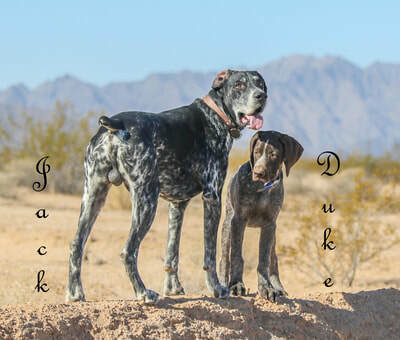 Trinity, is both Duke's grandmother and great grandmother. 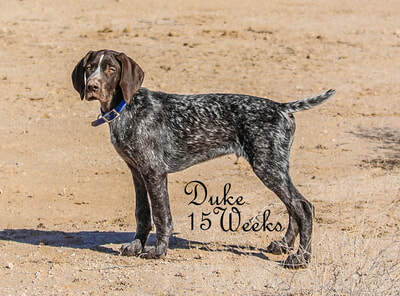 Gunther is Duke's Great Grandfather.